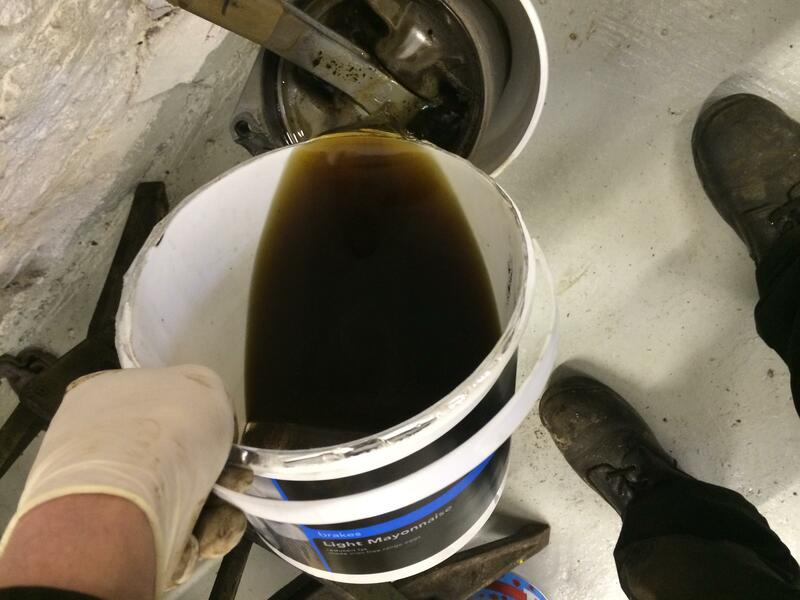 then placed the sleeves in containers and flooded the back of them with our Special Brew. 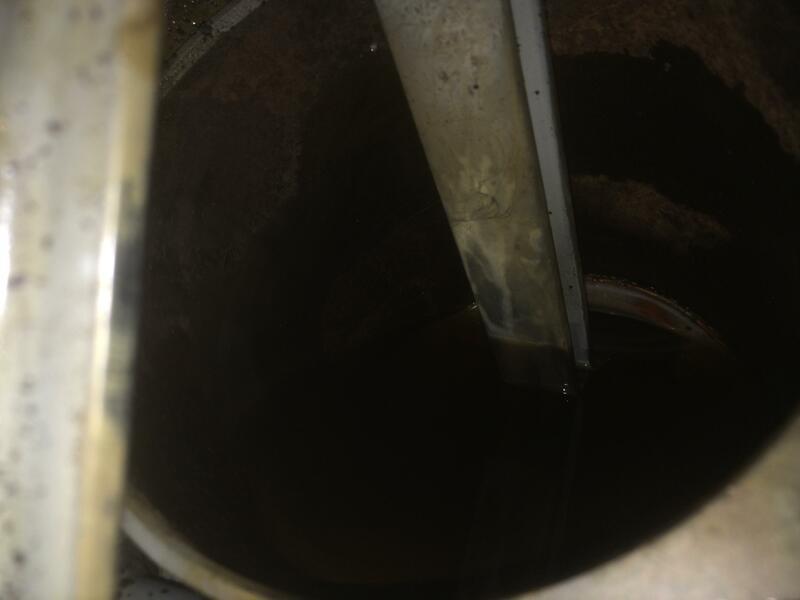 After only a couple of hours the Special Brew had started to work its way through. While these are soaking, Pete machined up a base plate to fit our 20 tonne press, so the sleeves will sit square and hopefully we can push the pistons down out of the sleeves. The rear case came of quite easily, we used a chain pull to extract the case through bolts. 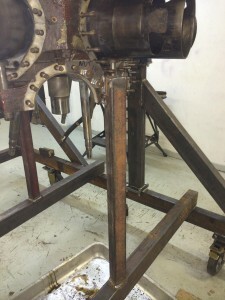 Once all of the bolts are extracted the rear case is lifted off, then the rear maneton bolt is removed, now that was tight! 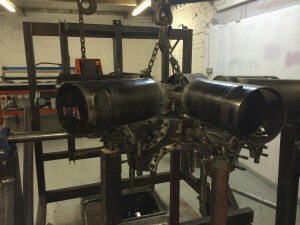 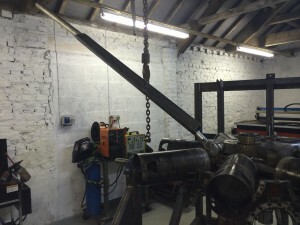 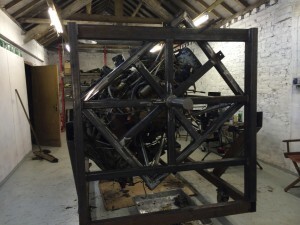 The rear row of cylinders can now be lifted off. 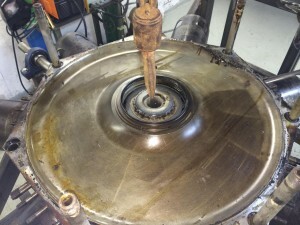 Now it is time to remove the pistons. 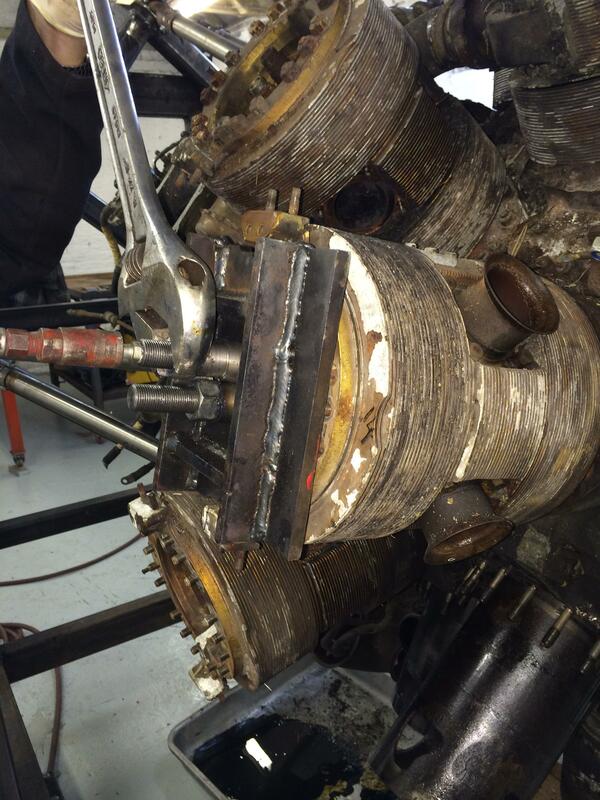 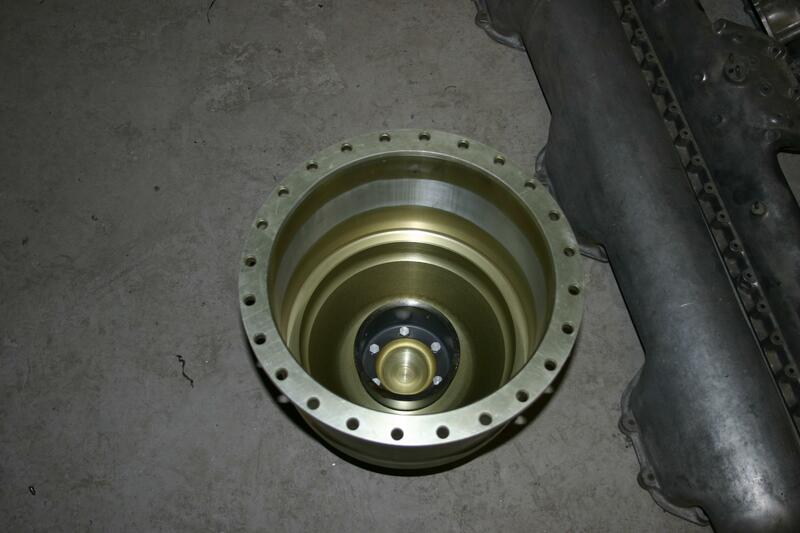 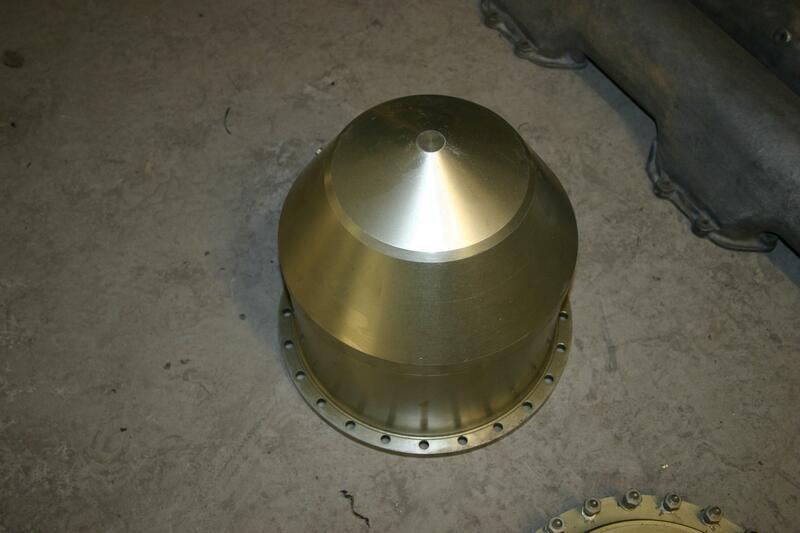 First we placed in a 20mm spreader plate on top of the piston, this should spread the up to 20 tonne pressure across the face of the piston. 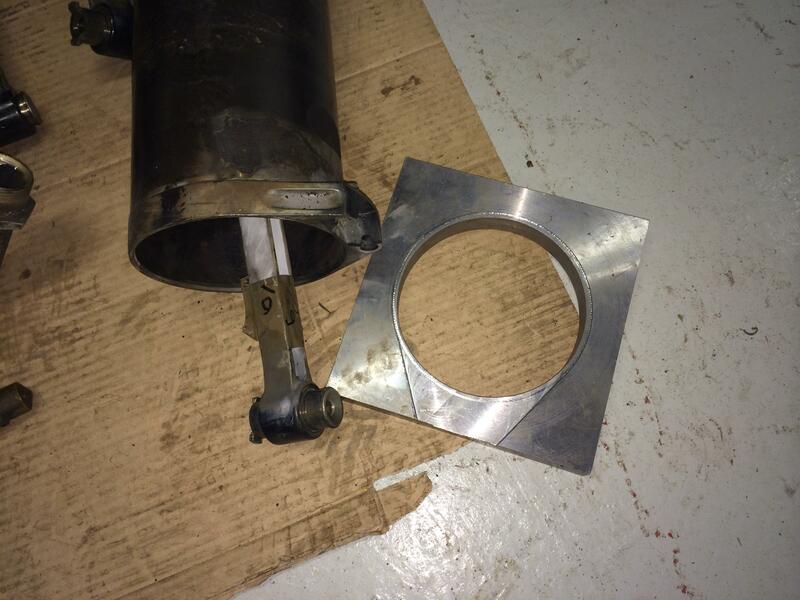 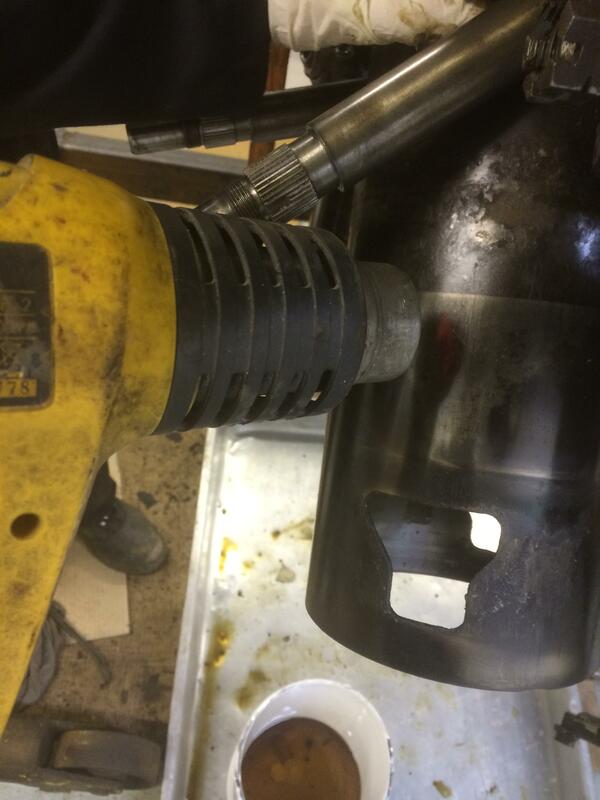 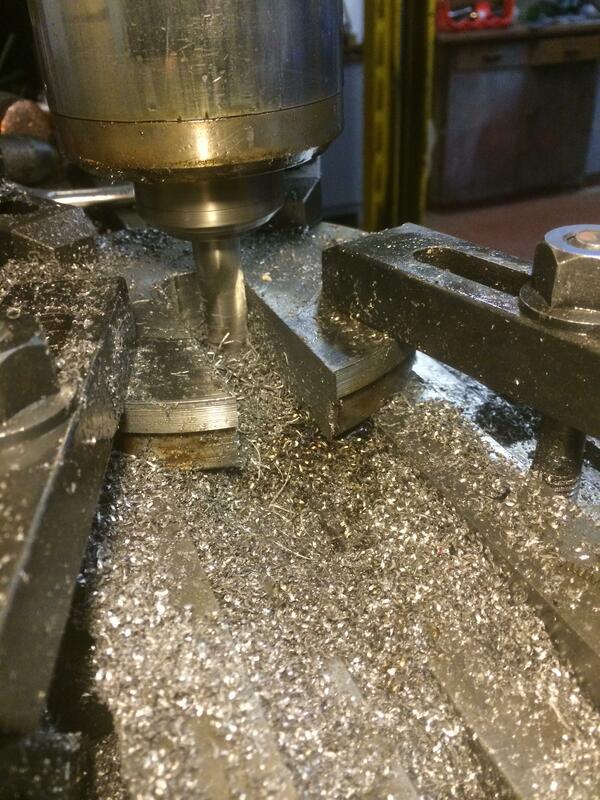 After a little pressure the first sleeve gave birth to a piston! 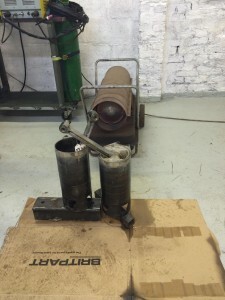 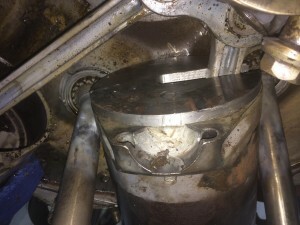 A couple of the pistons were a bit on the tight side,so we filled the sleeves with special brew and warmed them up in front of the space heater, which worked a treat. 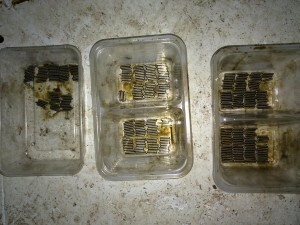 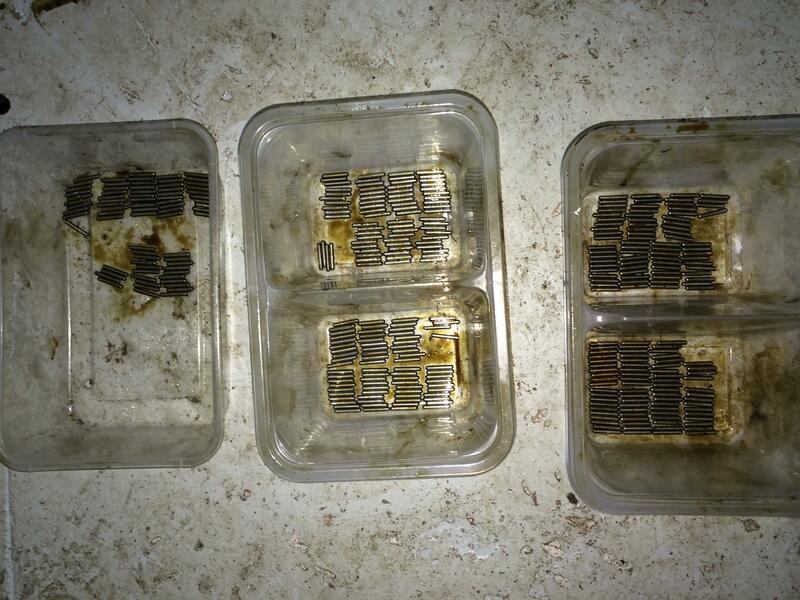 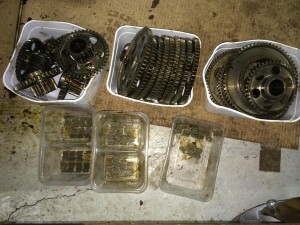 The last pistons to remove was the master rods 4 and 11, these were a little bit more tricky to clean, as there was less space to work in. 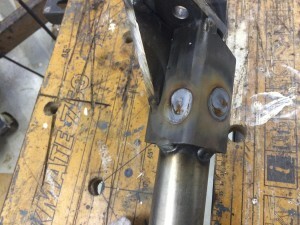 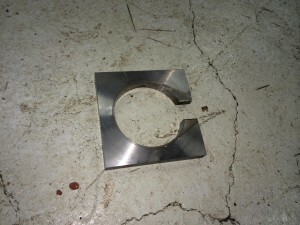 Pete altered the base plate to allow for the master rod. And there we have it, the final piston removed. 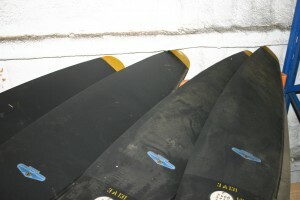 All the children safely tucked up in bed ready for cleaning. 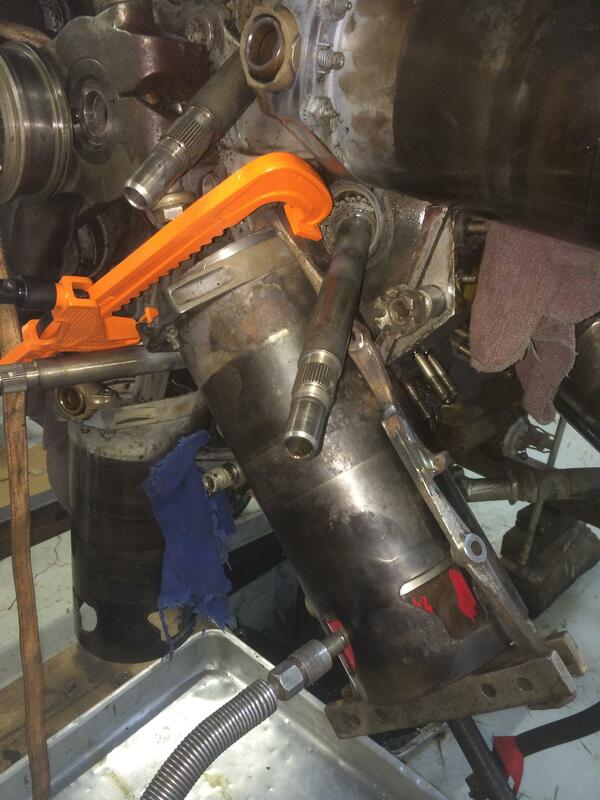 We decided to make a crankcase mount addition to the engine stand. 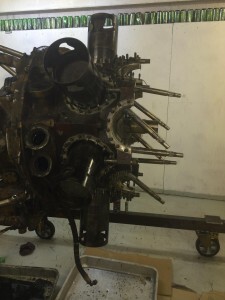 this will enable use to rotate the engine into the vertical position to allow us to remove the engine mount ring, supercharger, rear section of crankcase and finally the back row of con rods and pistons with sleeves. First thing we did was make some plates that mount onto each side of the middle section of the crank case at cylinders 4 and 12. 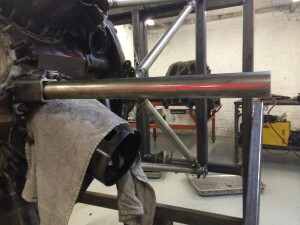 After tacking some box section onto the plates we then fitted 40 mm shafts into the box and using a laser to ensure the shafts align through the engine. Next job was to build up a frame each side to mount a pair of bearings. 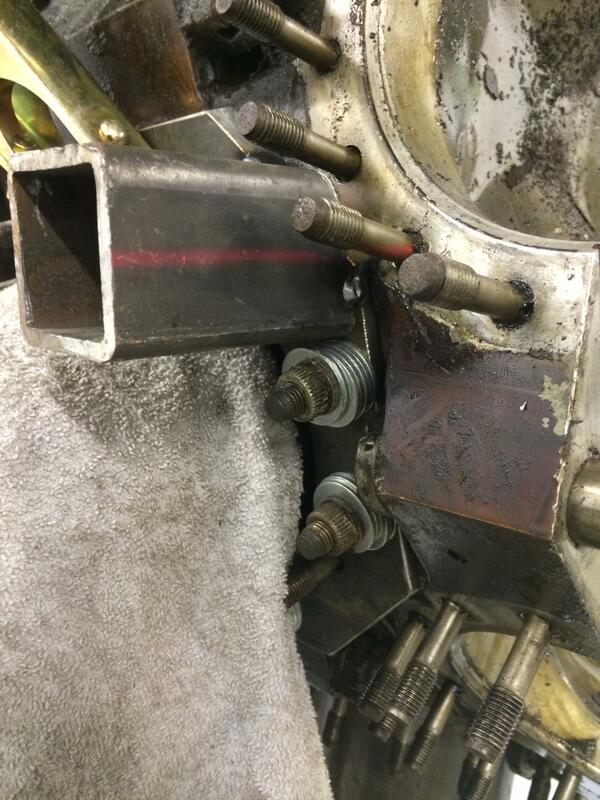 We then added a pair of bars to enable us to lock of the engine in the vertical position. 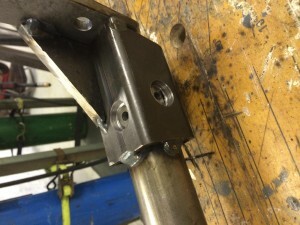 We drilled holes in the box section to allow us to plug weld the shafts. The moment of truth! 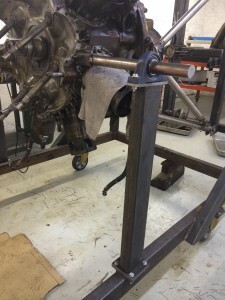 take the weight of the engine at the rear and remove the engine mount, then rotate the engine into the vertical position. We then added a couple of extra steady posts, next job removal of engine mount ring and supercharger. 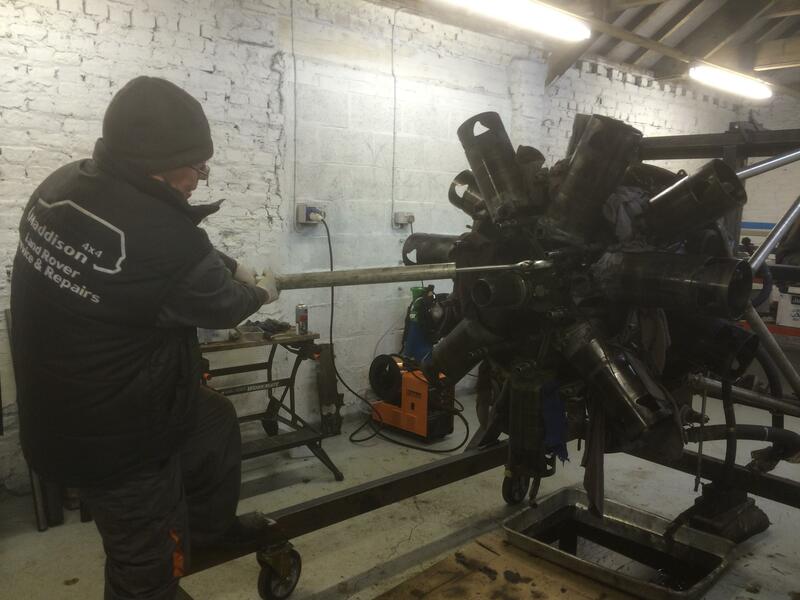 To remove the gearbox we had to remove the top two pins on the engine mount and lower it down to give us enough remove to remove the gearbox. 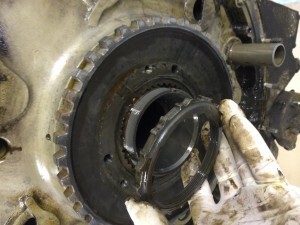 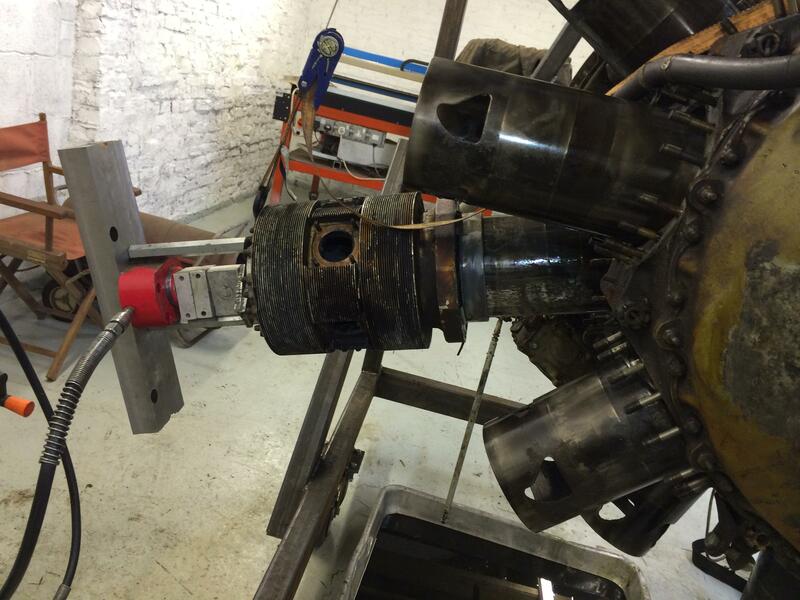 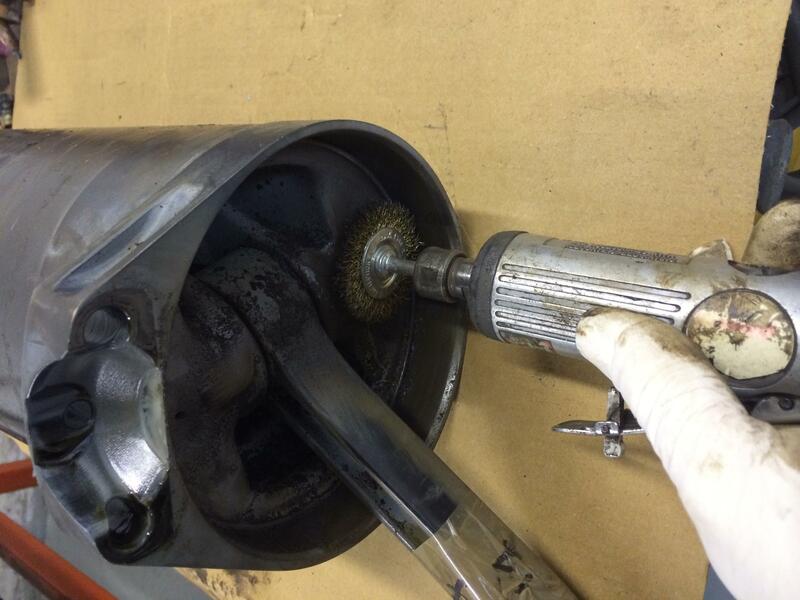 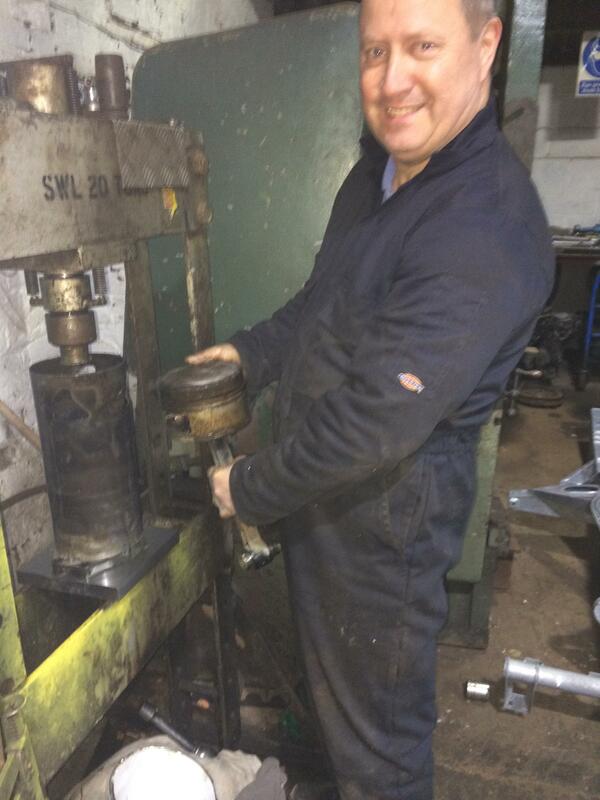 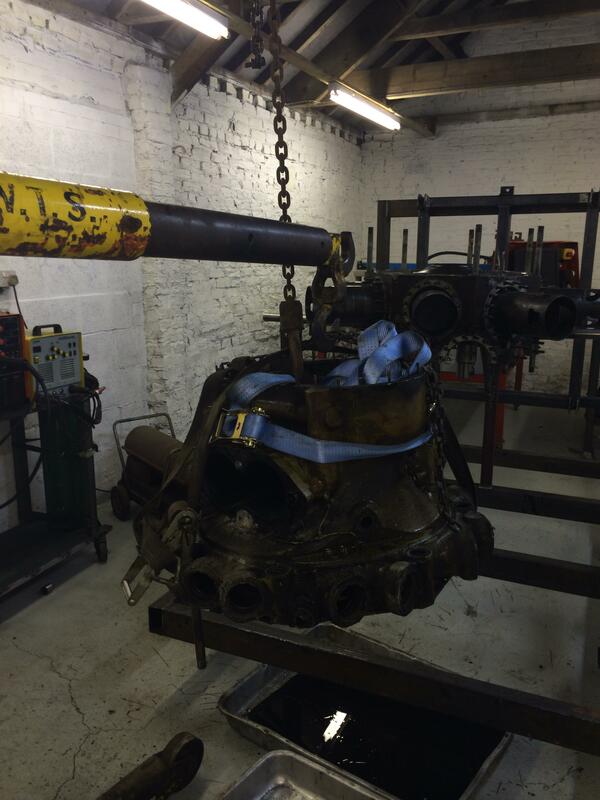 Then after removing a load more nuts we lifted off the gearbox. 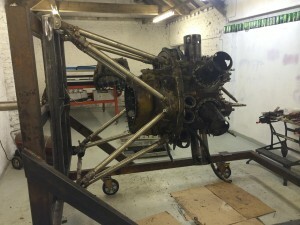 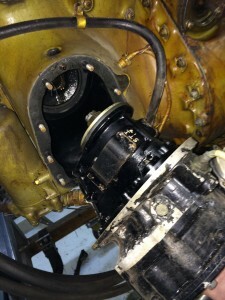 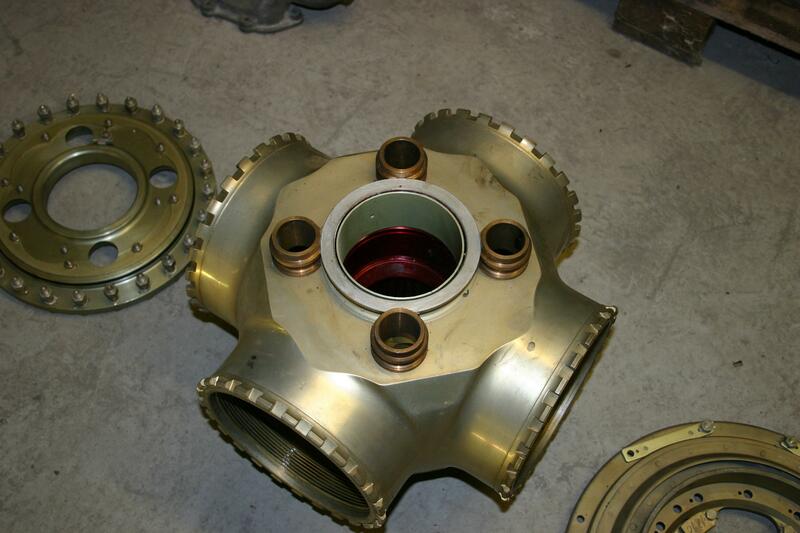 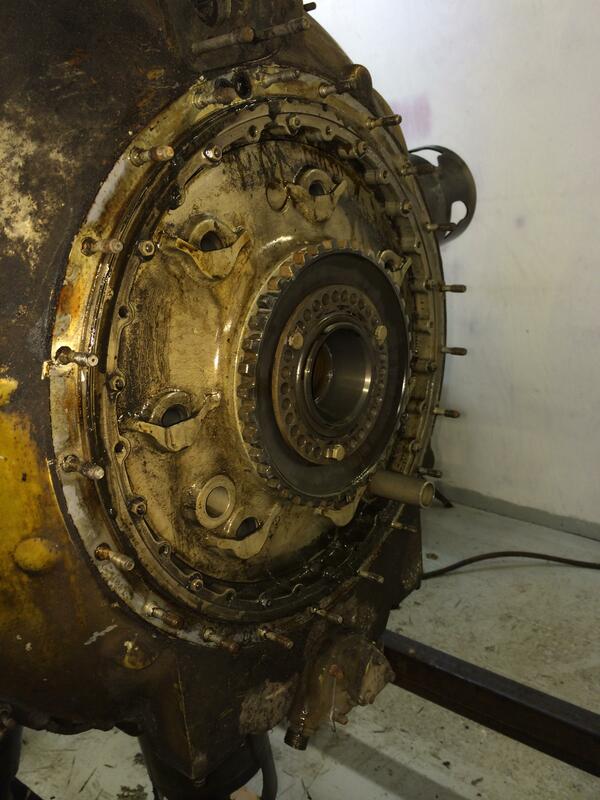 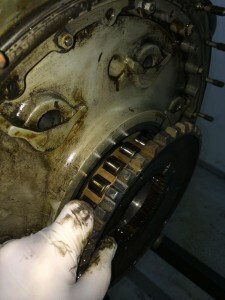 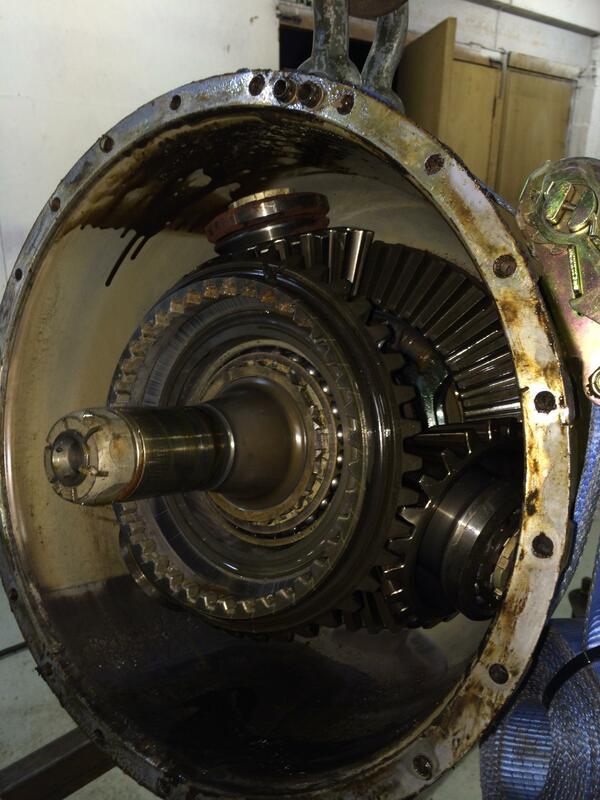 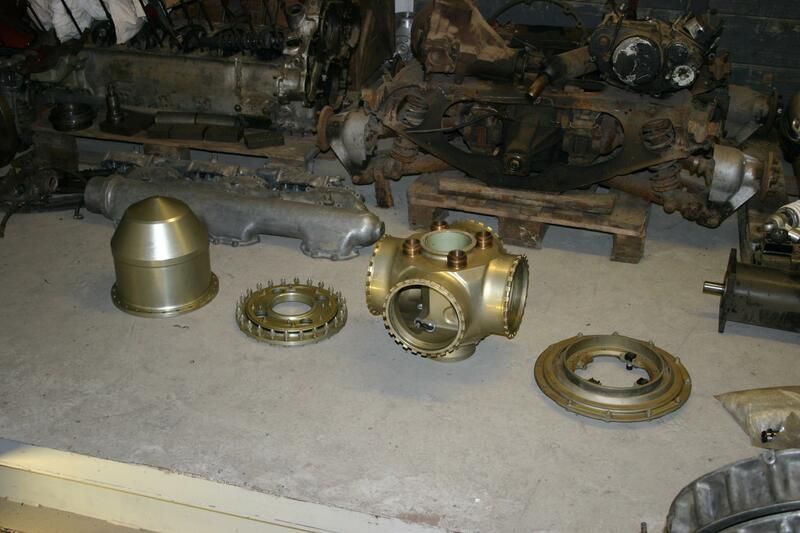 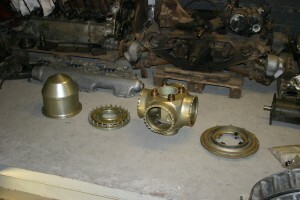 The gearbox looks in good condition with plenty of oil coating all of the vital parts. 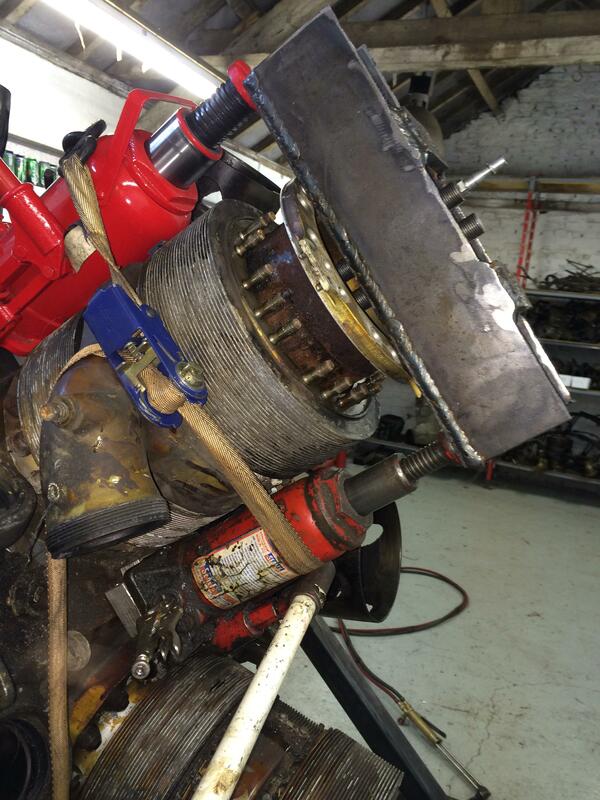 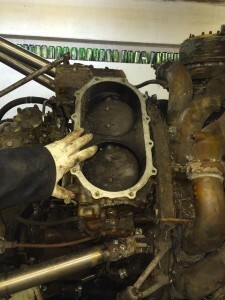 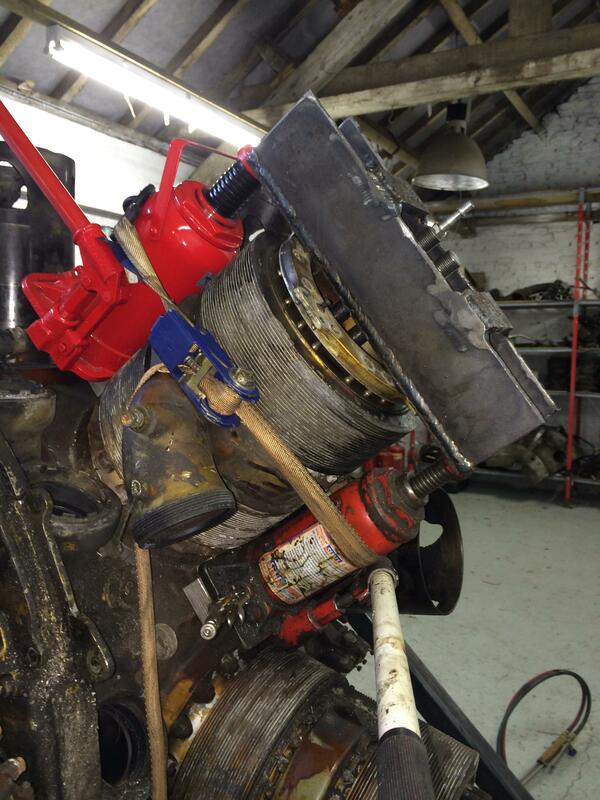 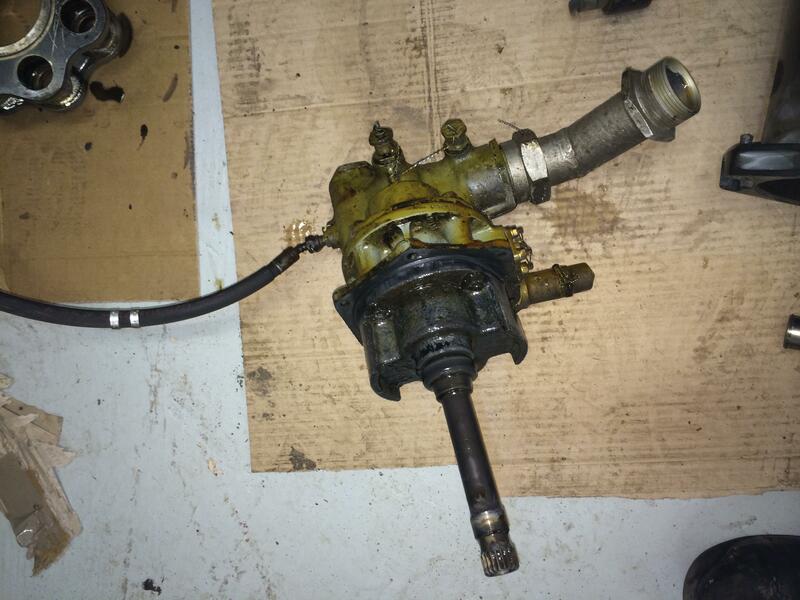 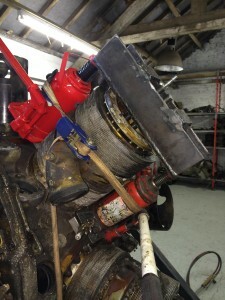 After lifting the engine backup we then removed the oil pump and sump. 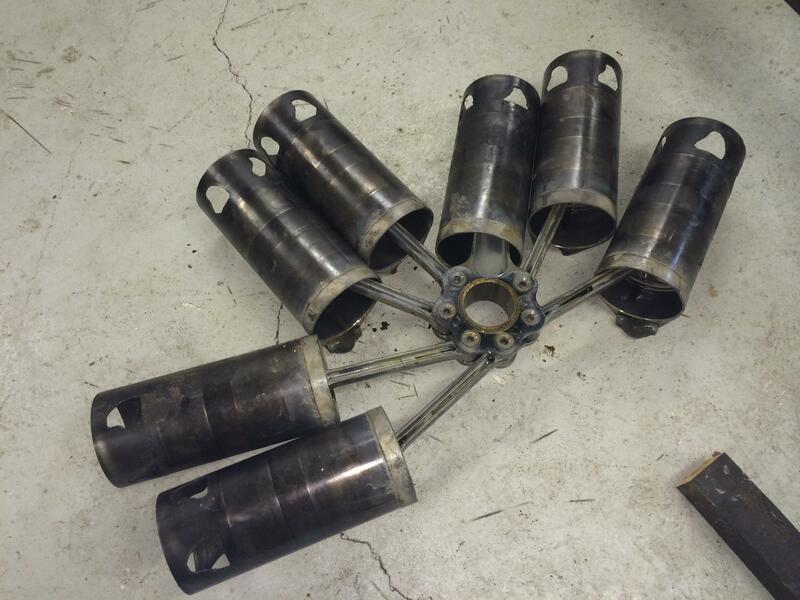 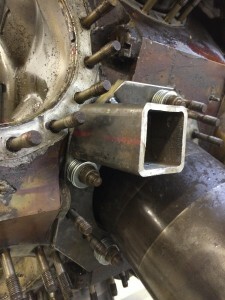 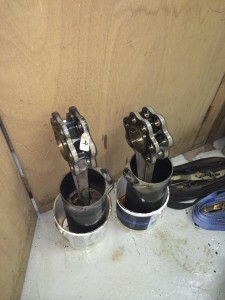 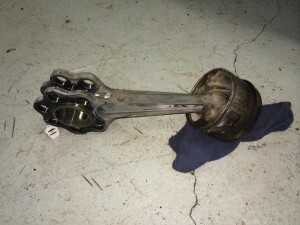 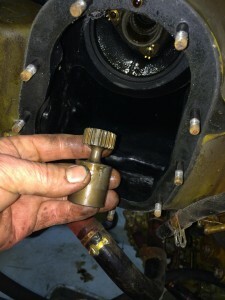 One of the reasons we have to dismantle the crank case is, we need to remove the sleeves, pistons and con rods as one unit, as the pistons are stuck in the sleeves. 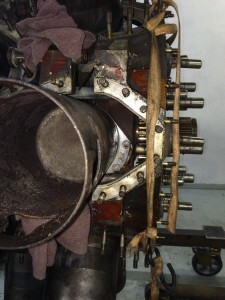 The condition of the sleeves below the pistons is in very good condition so they should push out with little effort. 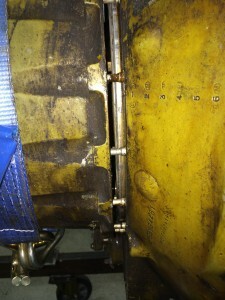 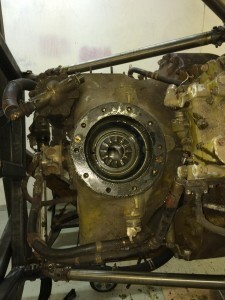 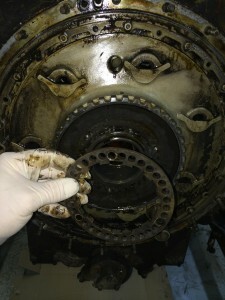 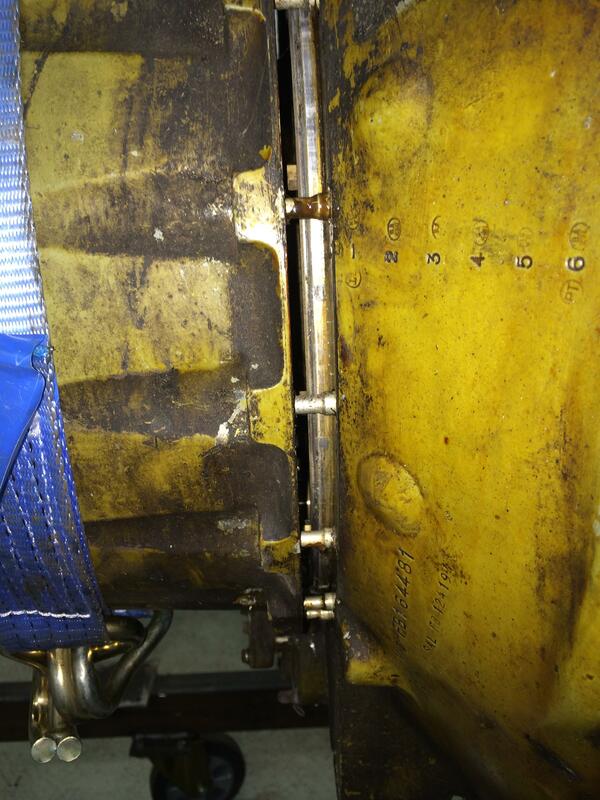 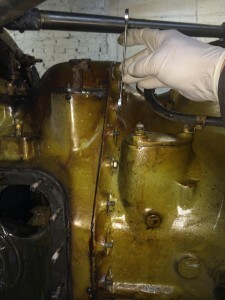 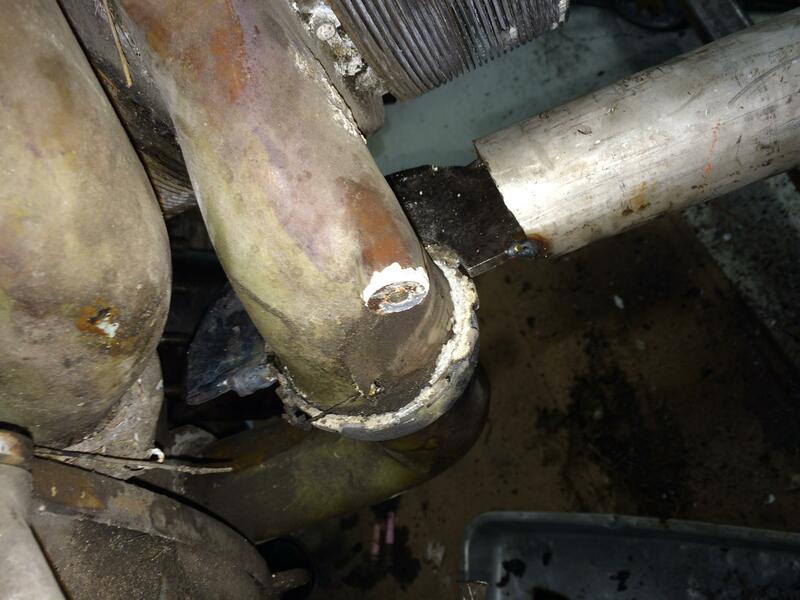 Starter removed, as you can see the internals of the engine is in very good condition. Next job was to remove the Hobson Injection System. 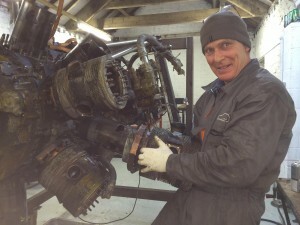 As Pete was away driving a A340-600 to Sydney and back I used the third member of the team to assist , Mr Engine Hoist. 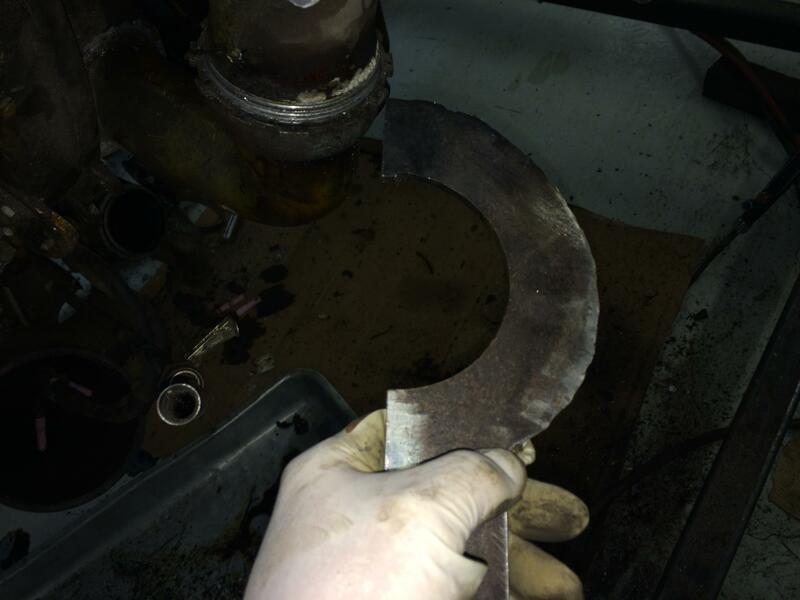 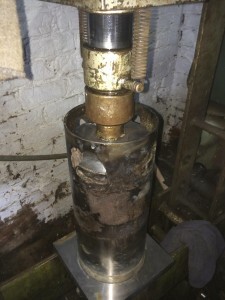 Next job was to remove the reduction gear, as per the manual a little tap with a hide hammer and it came off. 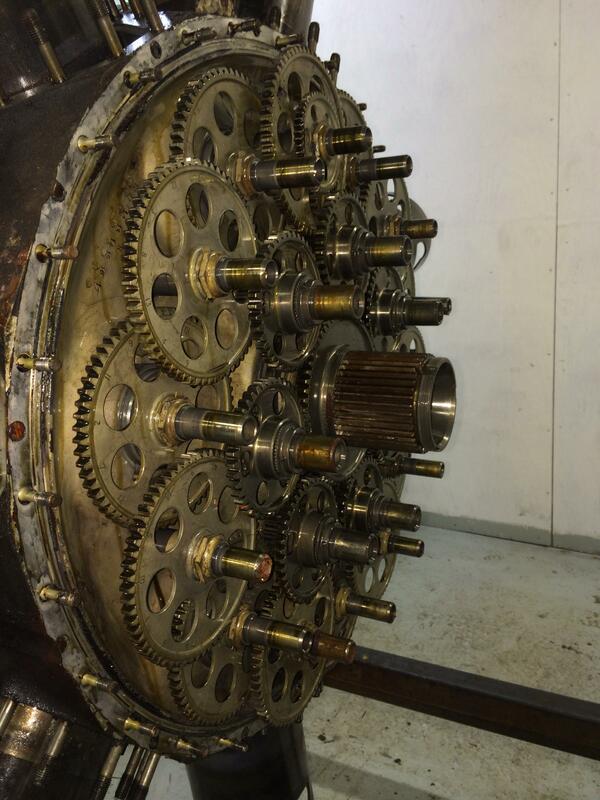 The condition of the reduction gear is excellent , and turns freely for the first time in thirty five years or so. Next to come off was the reduction gear drive gear. 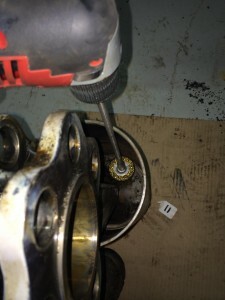 Take off the locking ring. Then take of the left hand threaded lock nut (good job I read the manual!) 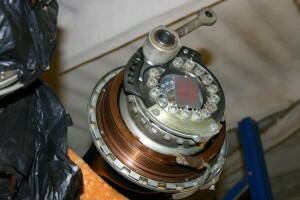 then remove the gear with the inner race of the front cover. 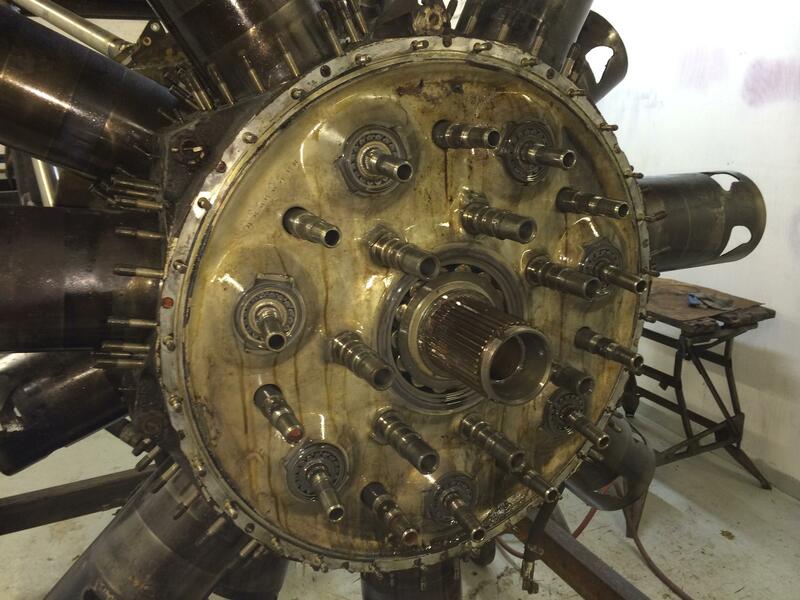 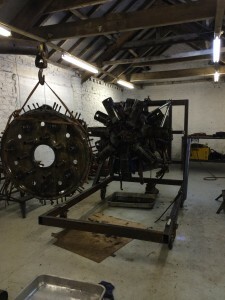 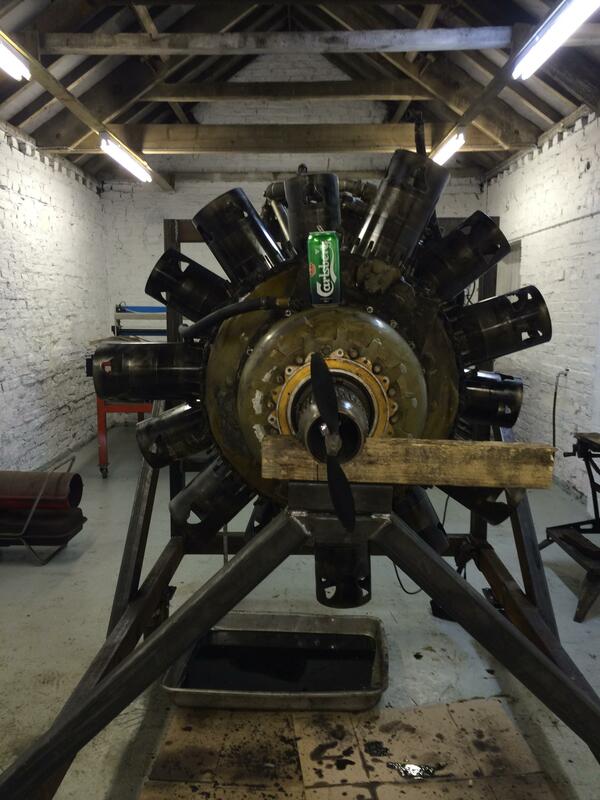 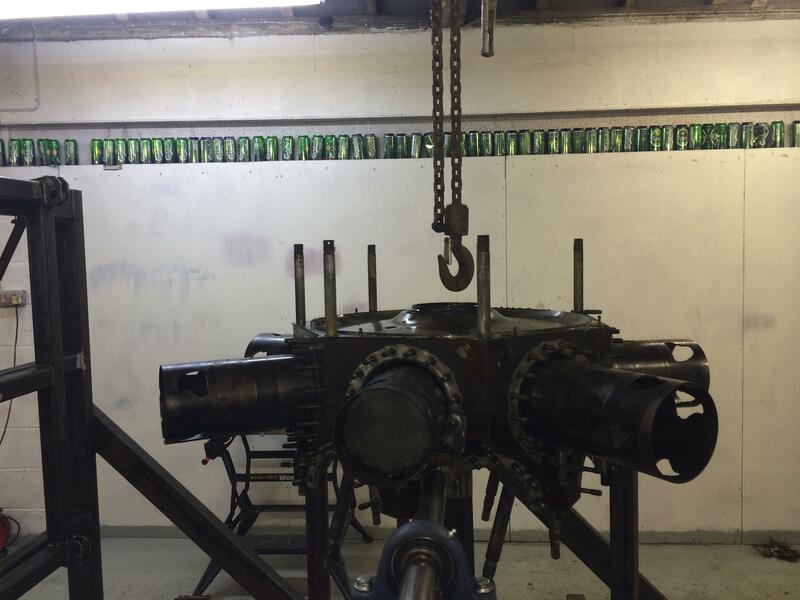 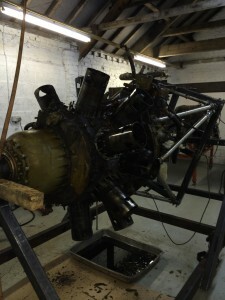 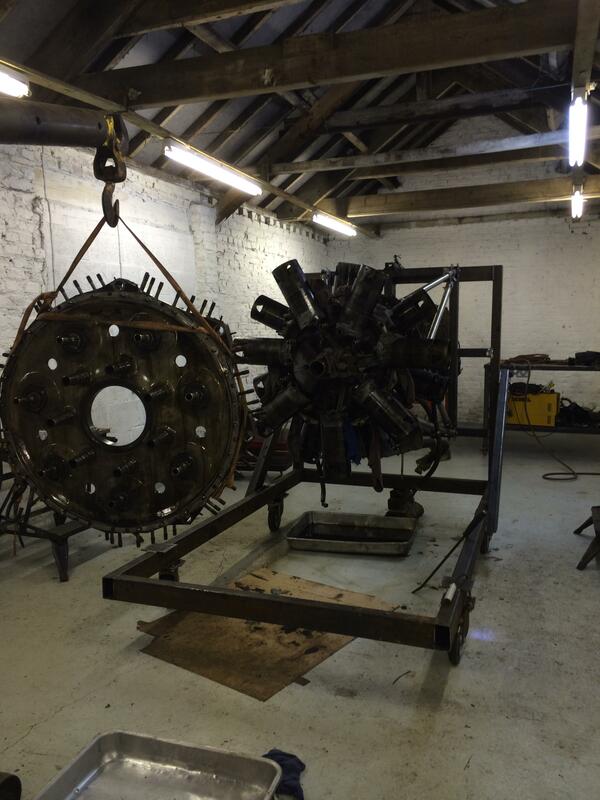 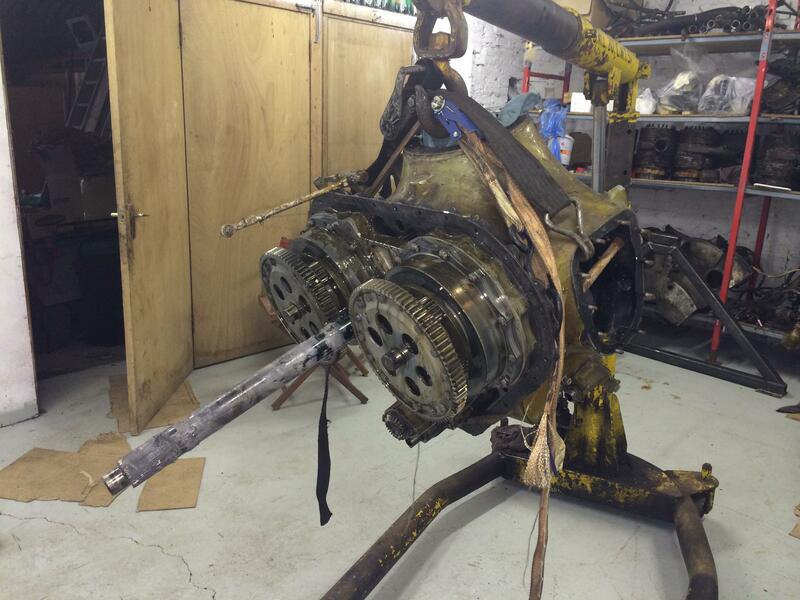 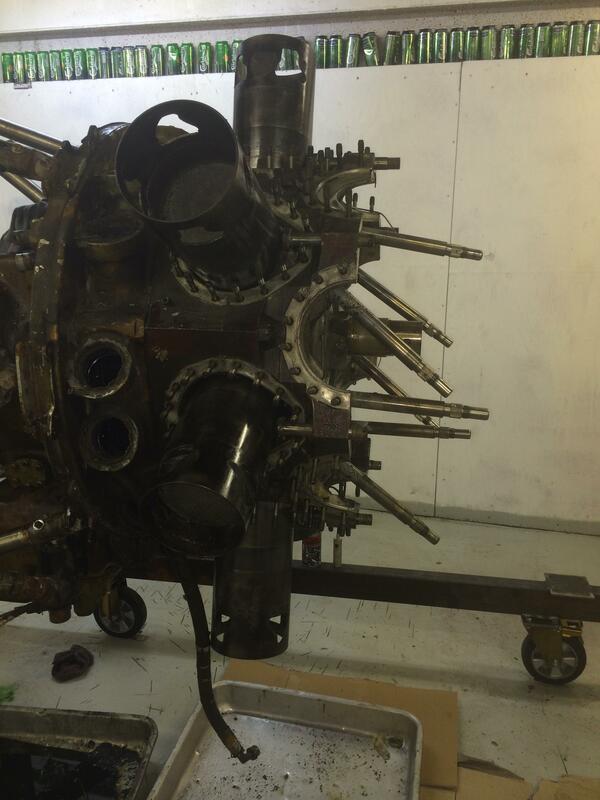 Next we will remove the front cover to reveal the wonders of the Bristol Hercules engine, the timing gears. 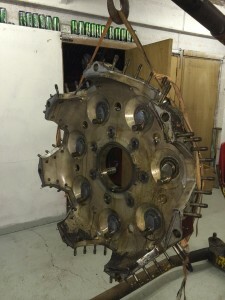 And in we go! Pete spent a good day in the workshop and stripped down the timing cover and gears. 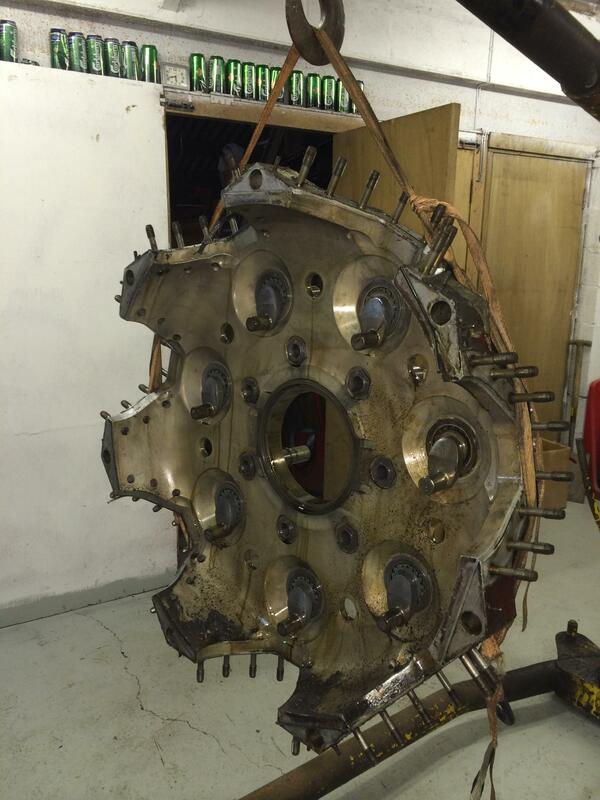 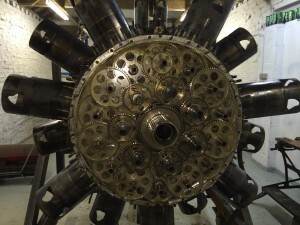 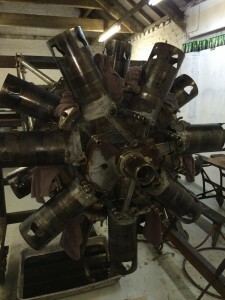 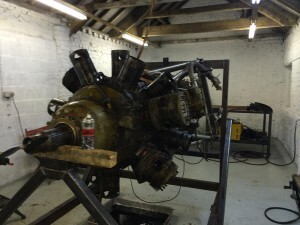 The wonders of a Bristol Hercules, you can not stop admiring the mass of timing gears but in fact it is quite simple. Next job was to strip down the gears. It says in the manual “Provide provision to catch the 74 needle rollers from each transfer gear” that is an under statement! 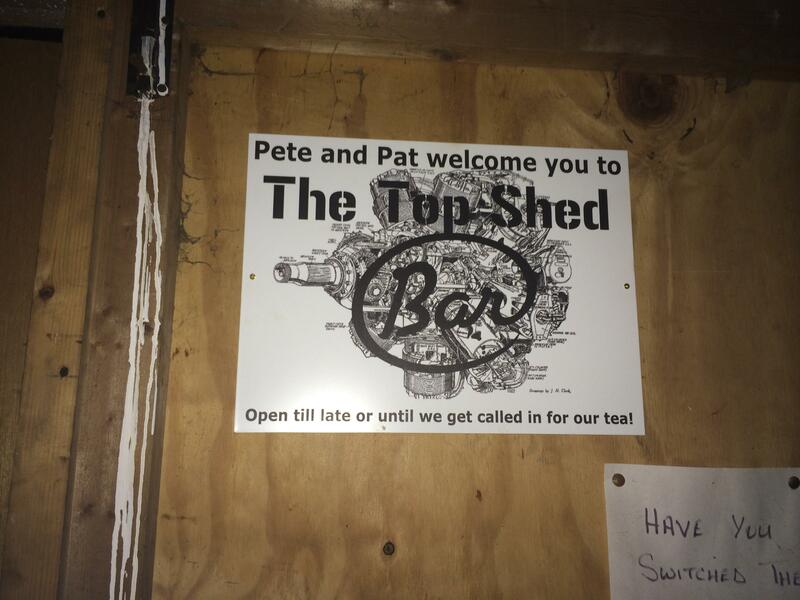 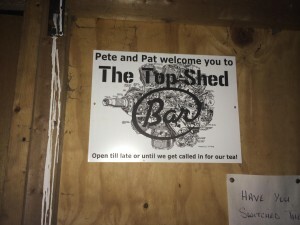 as Pete found out! 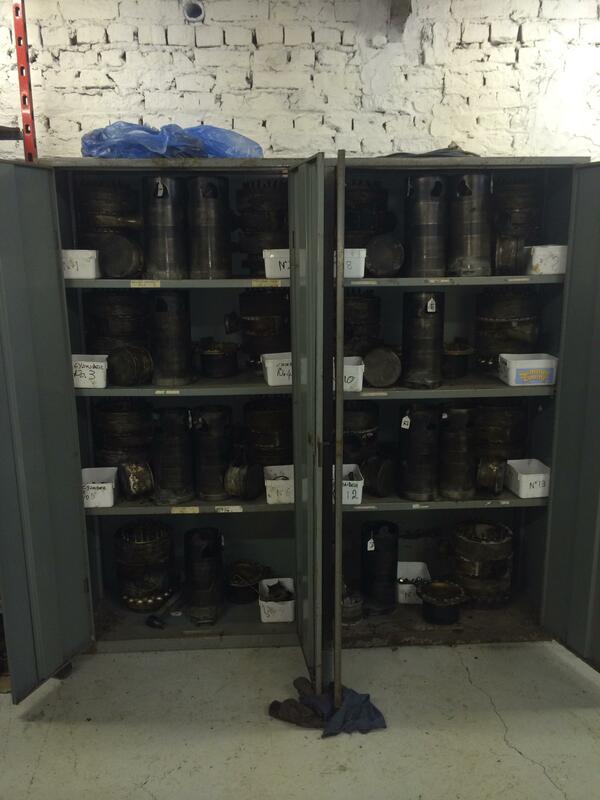 But they are all accounted for. 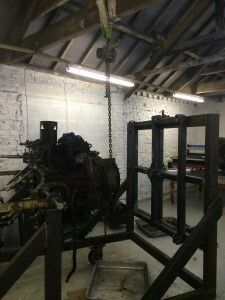 All the gears off now, next job is to remove the front section of the crank case, this will allow us to split the front section of the crankshaft. 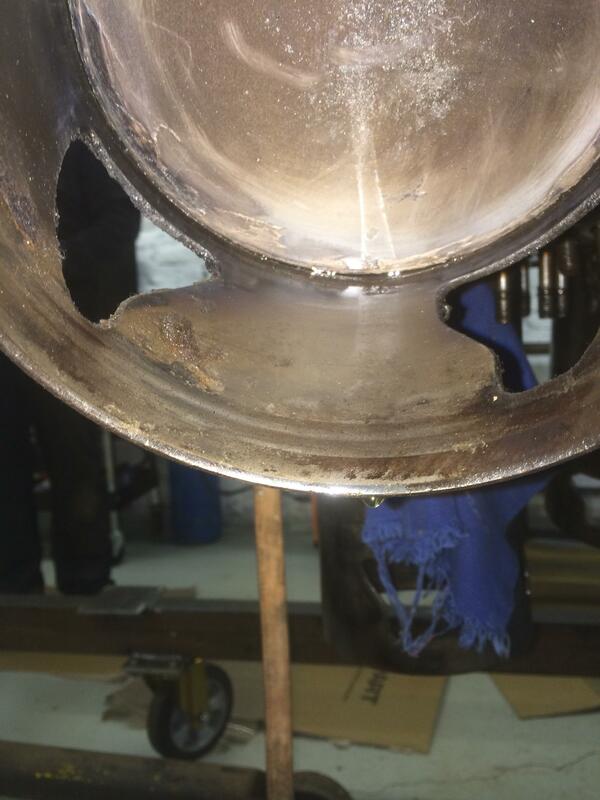 The front casing removal was quite straight forward, just get ready to catch the rollers from the front casing bearing. 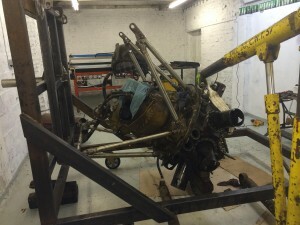 The next task is going to be a bit fiddly! 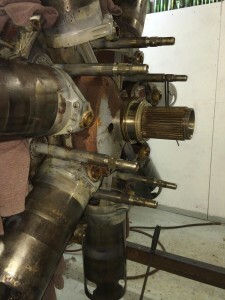 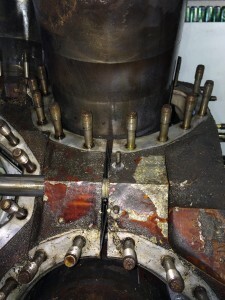 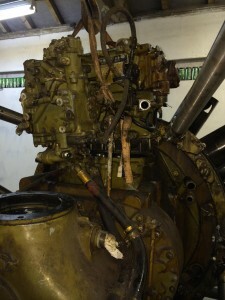 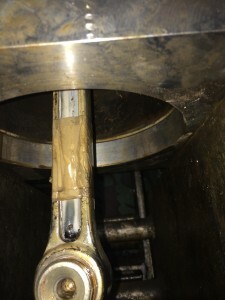 we need to get the bolts out of the front part of the crank to allow us to remove the first row of con rods with the master rod, then we can remove the bottom pins from the master rod to release the rest of the cylinders. First job undo the maneton bolts, using special tool FB.168782 or in our case a 3/4″ drive ratchet and a six foot scaffolding pole! they where FT or very tight! 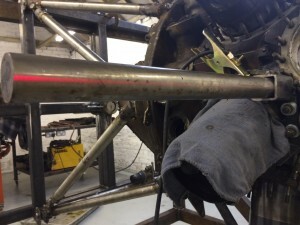 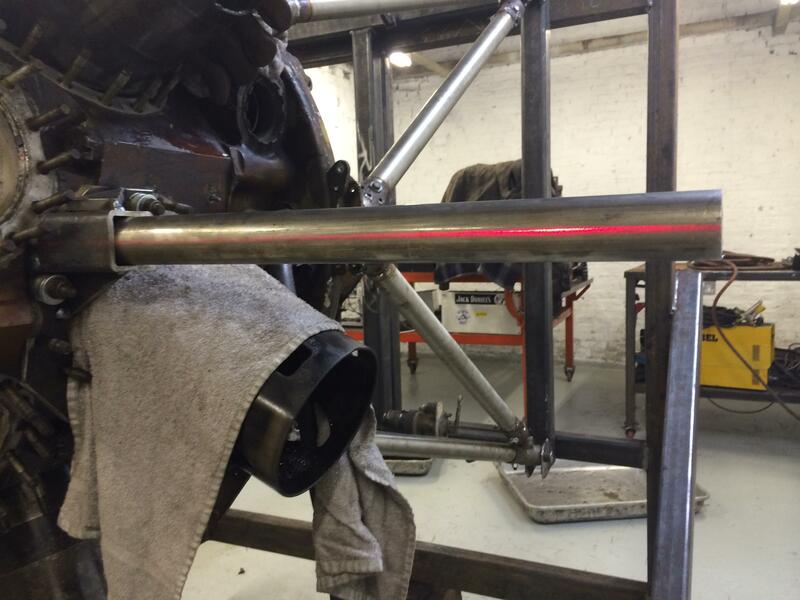 The rear bolt of the front maneton came straight out, the problem with the front bolt was that it fouled No.6 sleeve. 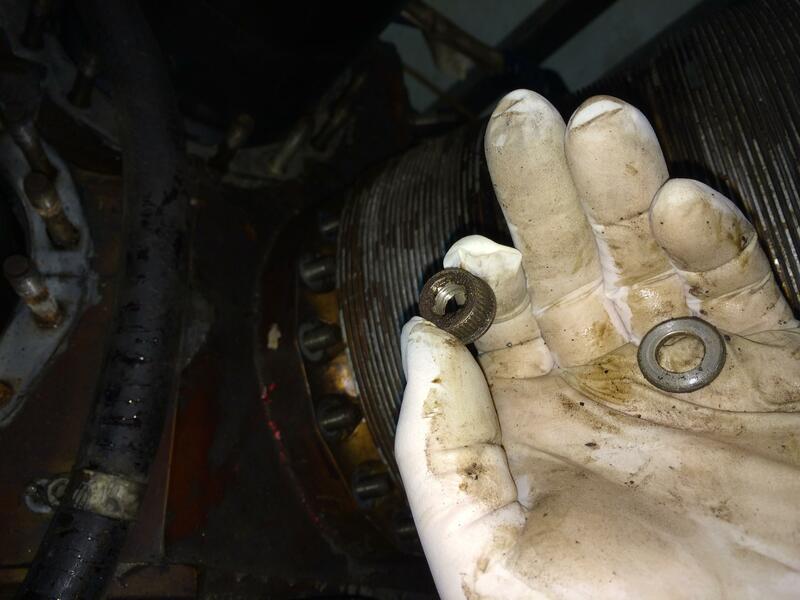 First we undid all of the sleeve ball joints, which gave us about 10′ of rotation of the engine, this was still not quite enough for us to get the front bolt out. 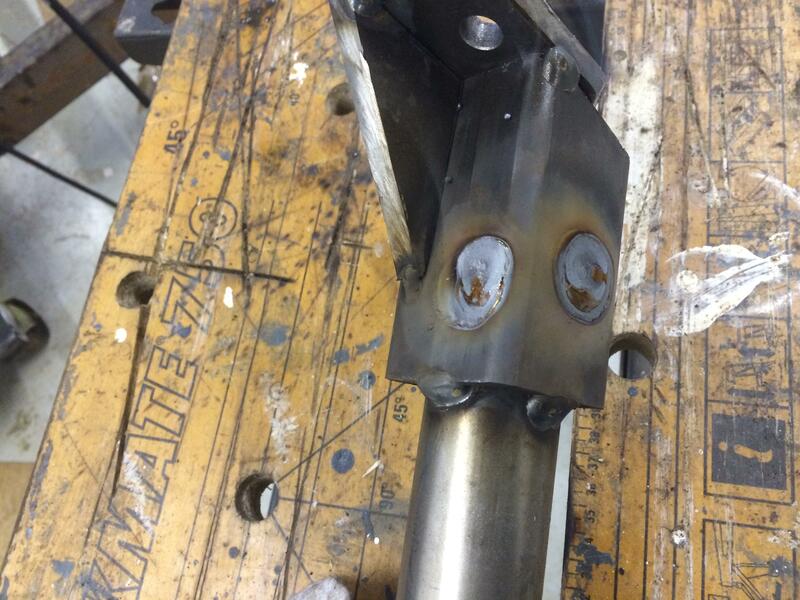 So we had move No.6 sleeve down a bit to give us clearance. 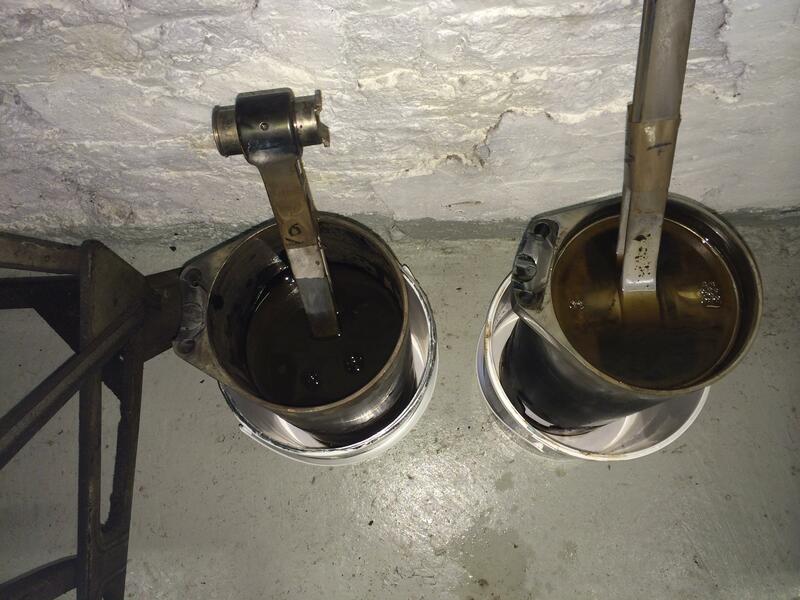 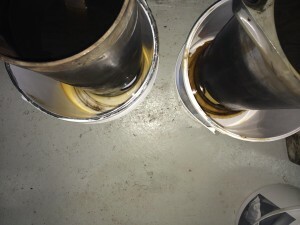 We mixed up our special brew of Forte Diesel Injector cleaner and Variable Vane Turbo Cleaner 50/50 mix and flooded the back of No.6 piston. After a twelve hour soak, the special brew had worked its way through and was dripping out of the sleeve. Next we had to make up a puller to move the sleeve, we altered one of the cylinder removal tools by milling a slot in it to allow us to fit it at the base of the sleeve around the con rod. 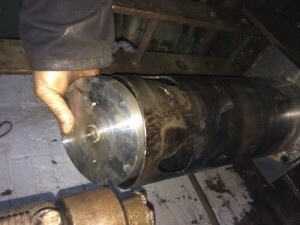 We only needed to move the sleeve about 1.5″ down to give us clearance. 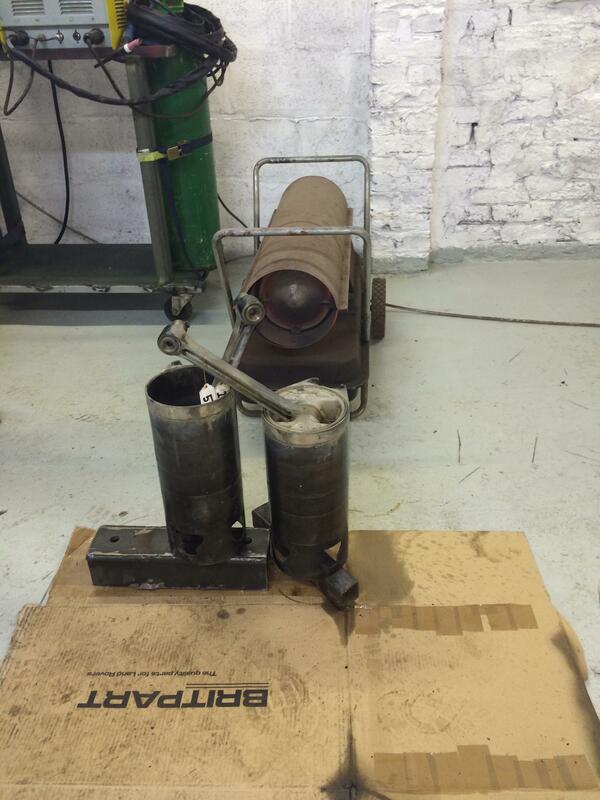 With a bit of gentle heat from a heat gun it soon moved down. 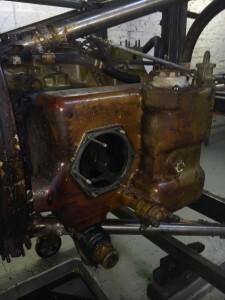 With both maneton bolts removed, it was a fairly straight forward job to remove the front part of the crank. 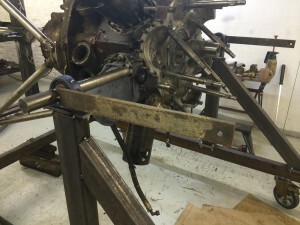 We then removed the front row master con rod and all of the slave rods as one unit, we then removed the circlips on the wrist pins and dismantled it. 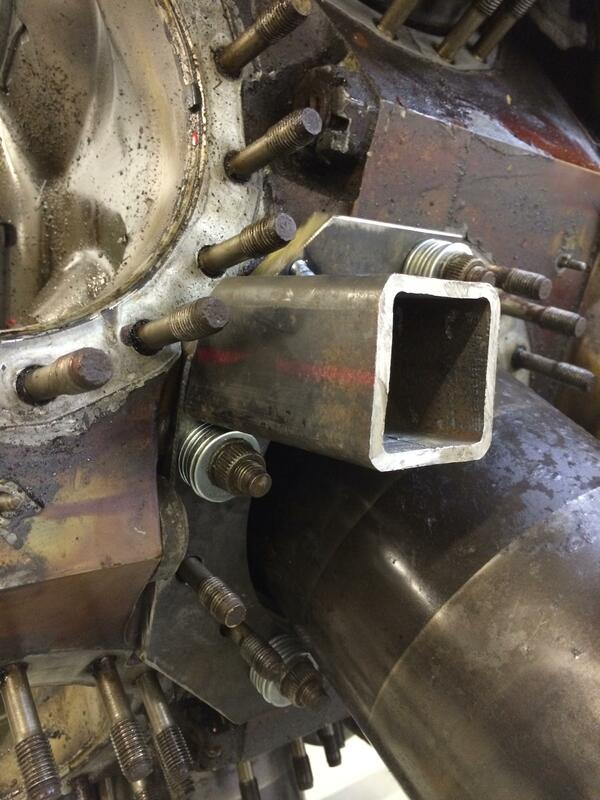 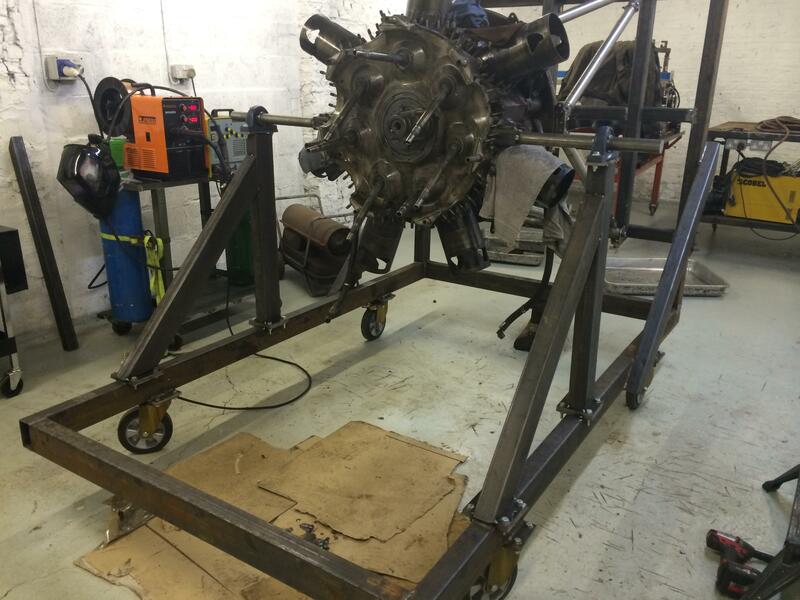 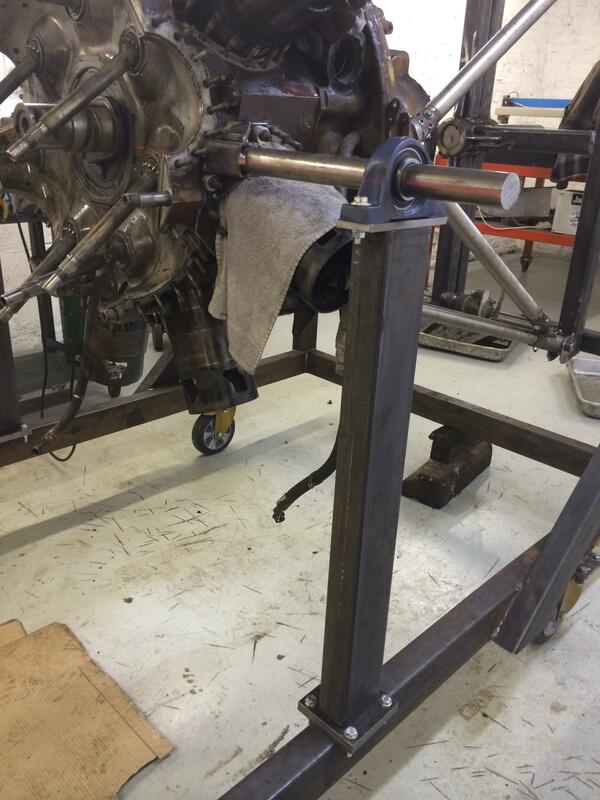 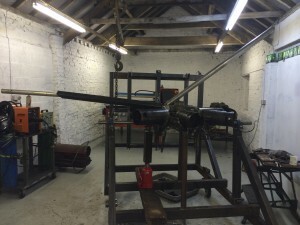 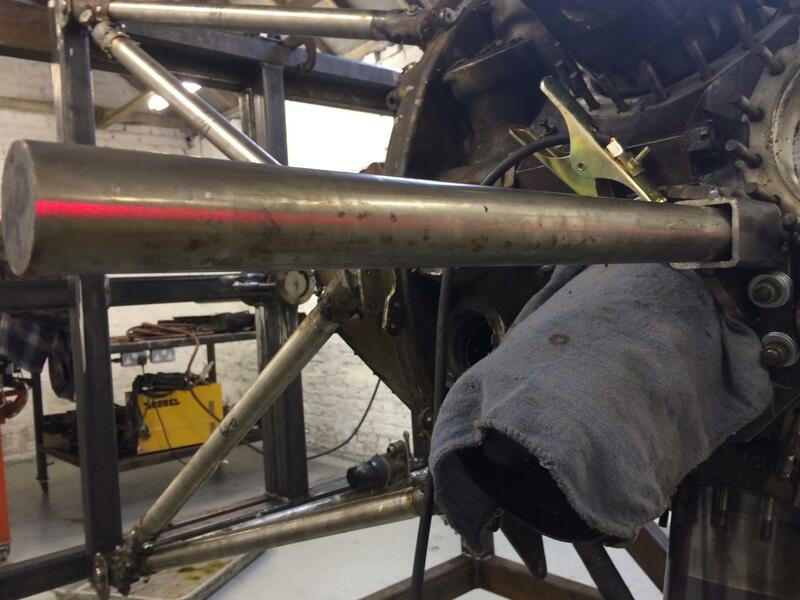 Next job make a crankshaft stand addition to our frame, this will allow us to rotate the engine unto the vertical position, this allow us to strip down the rear section of the engine, gearbox, supercharger and rear set of sleeves etc. 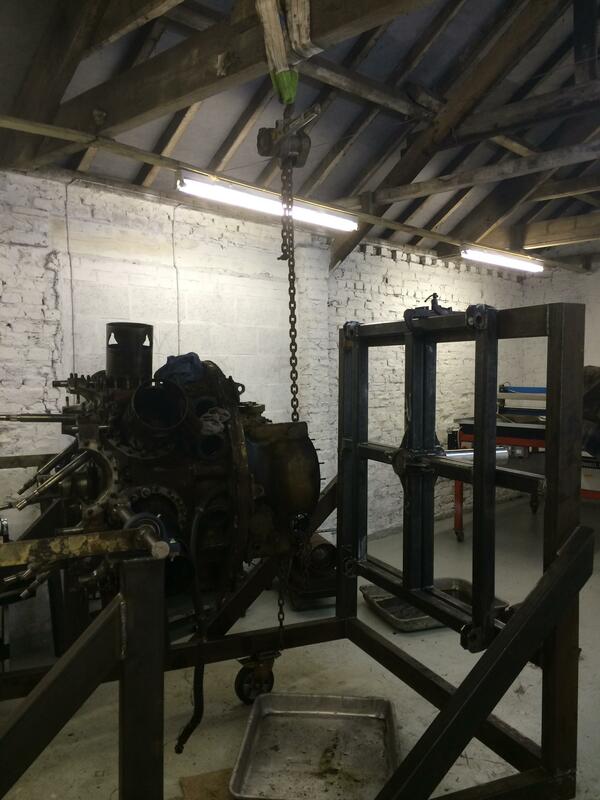 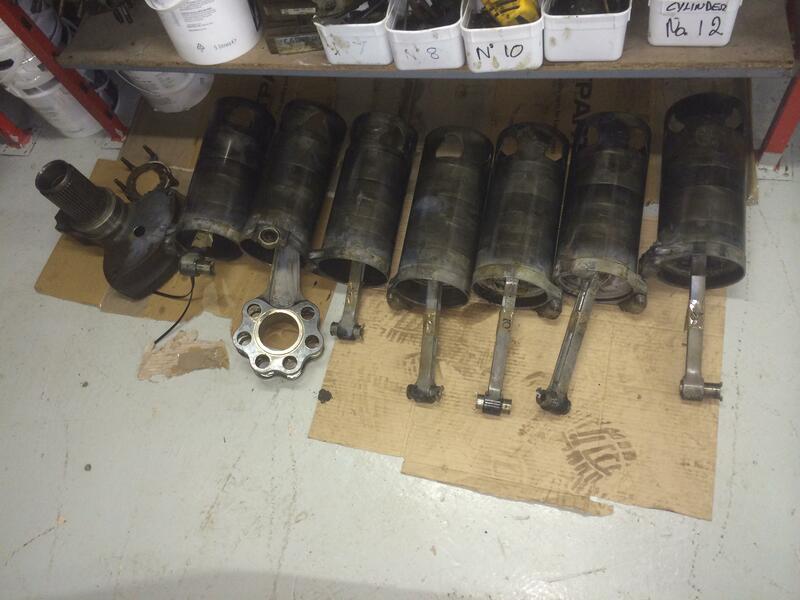 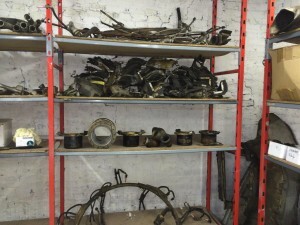 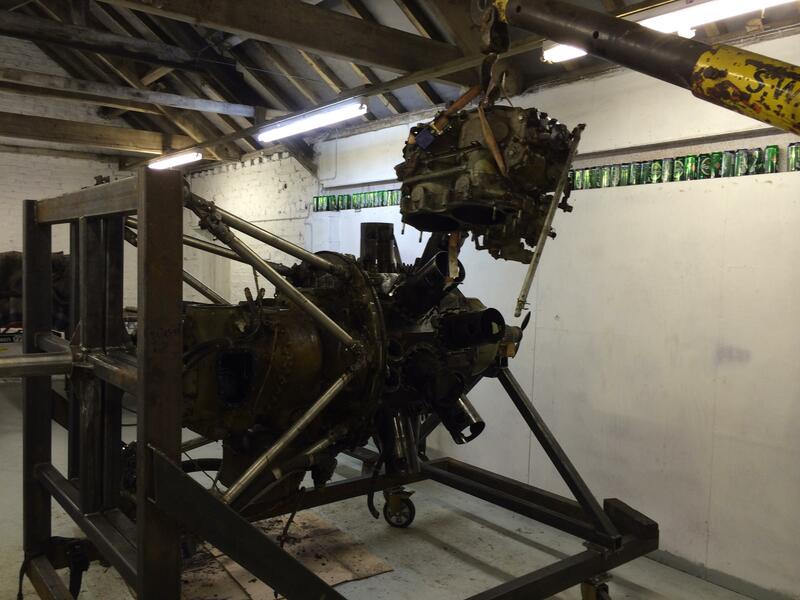 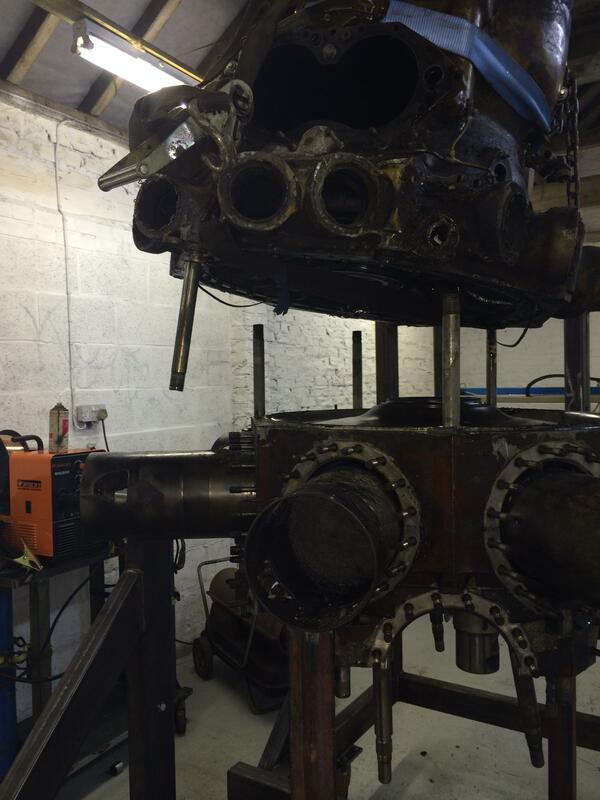 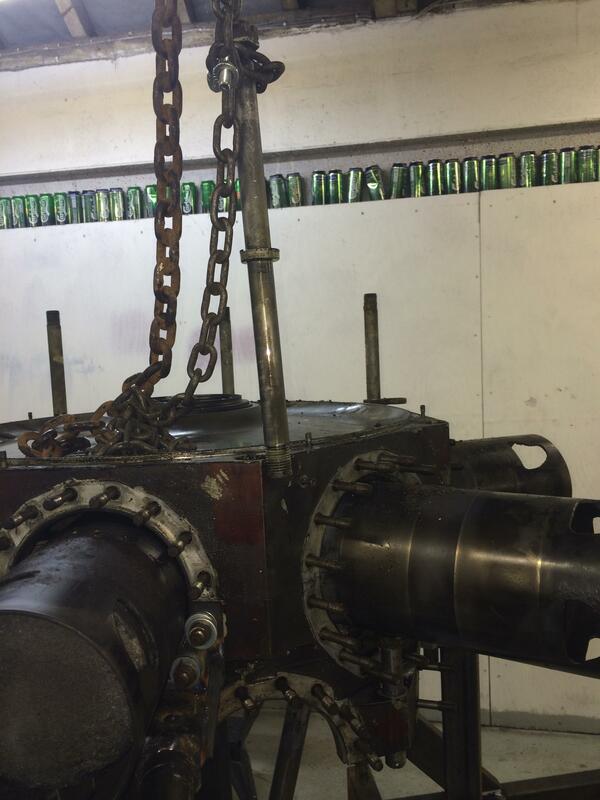 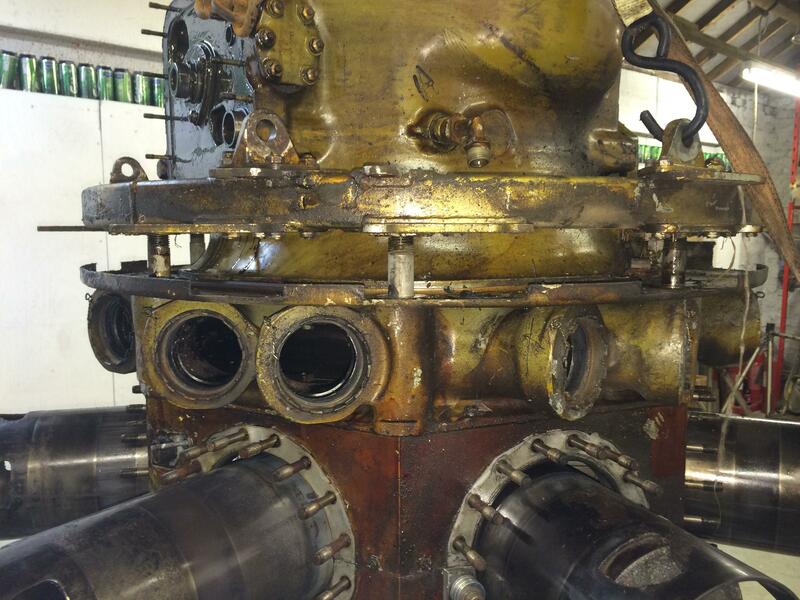 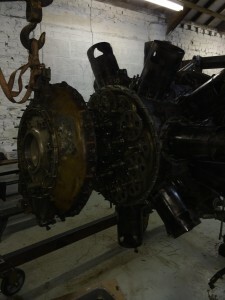 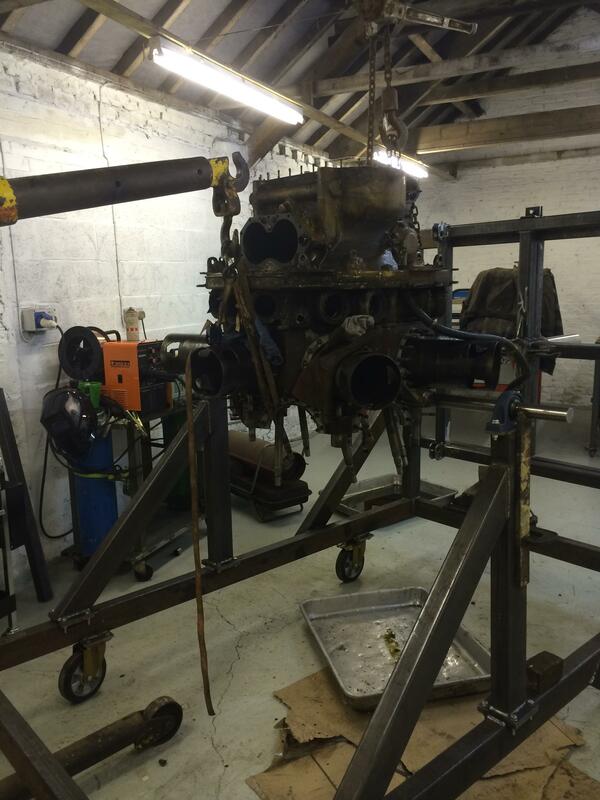 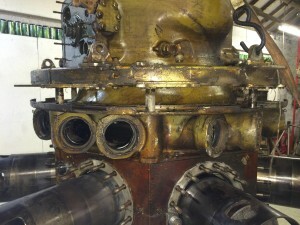 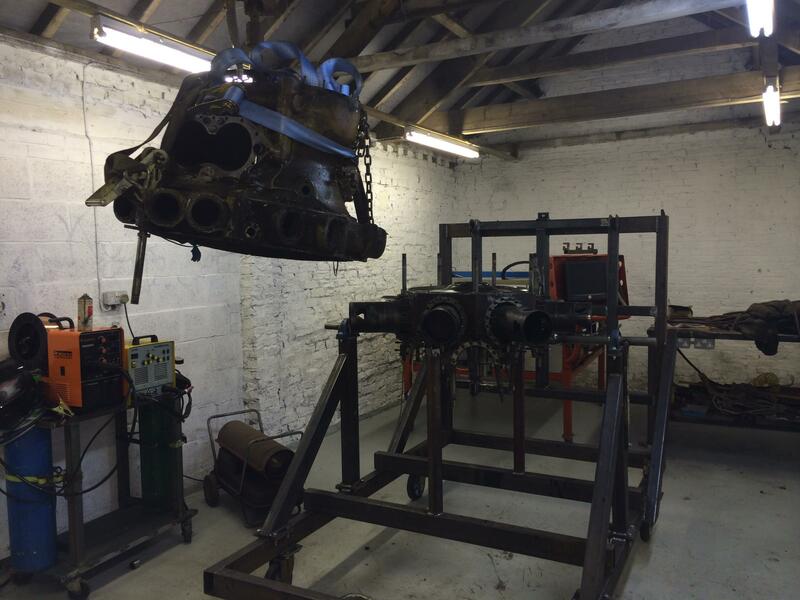 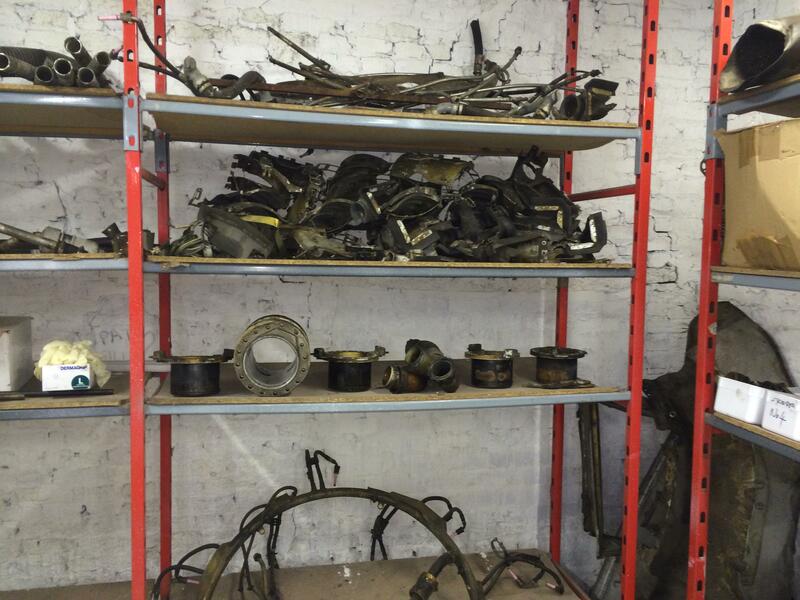 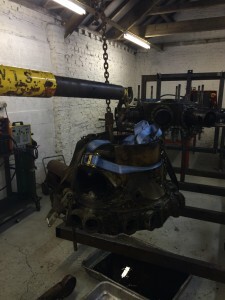 Well we finally got there, we have managed to remove all of the remaining heads and cylinders. 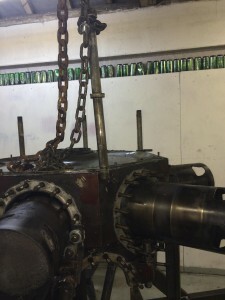 Typically the last head to remove No.3 was a tad on the tight side, but with the aid of a couple of bottle jacks it soon gave up. 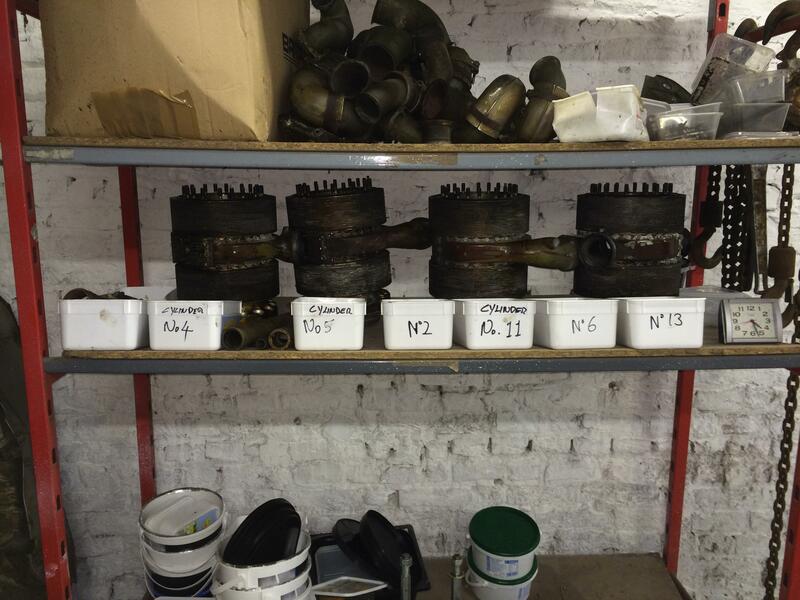 Cylinders 6,7,8 and nine came off very easily due to the oil seeping down the sleeves over the last thirty five years or so. 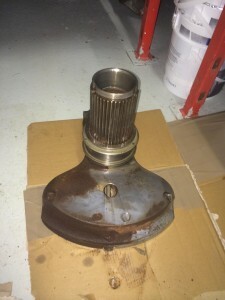 No 9 actually came off as per the manual, remove base nuts and slide off! The last cylinder to come off was No.3 , like the head it was a bit reluctant to come off, but with a bit of pressure from the 30 tonne jack we teased it off. 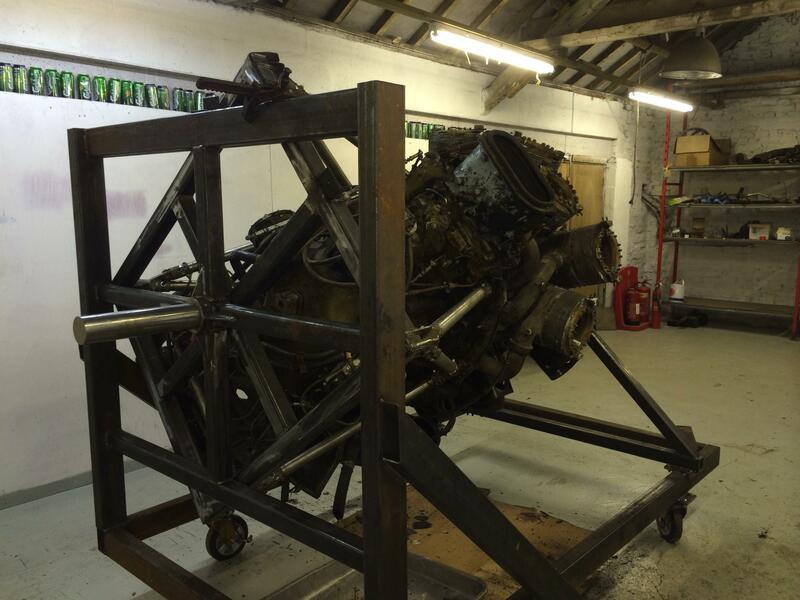 And there we have it, phase one completed. 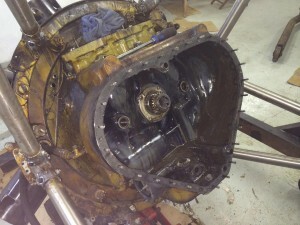 The next few jobs are to remove the magnetos and carburetor, then we will start stripping down the front of the engine. 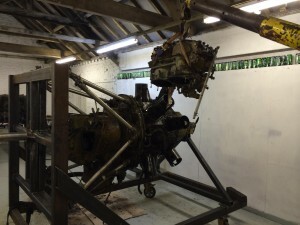 Well look what we have found! 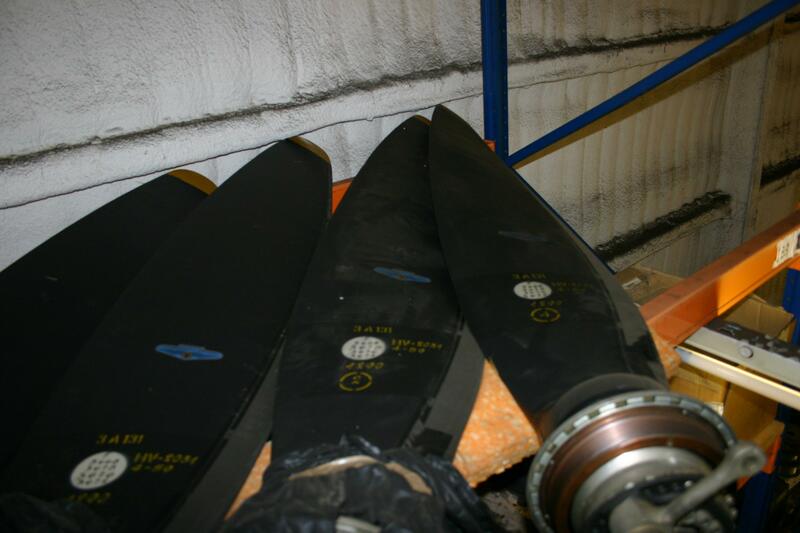 A brand new Rotol 4 blade prop, totally complete. Obviously we will not be running this prop but will trade it for parts we will require. 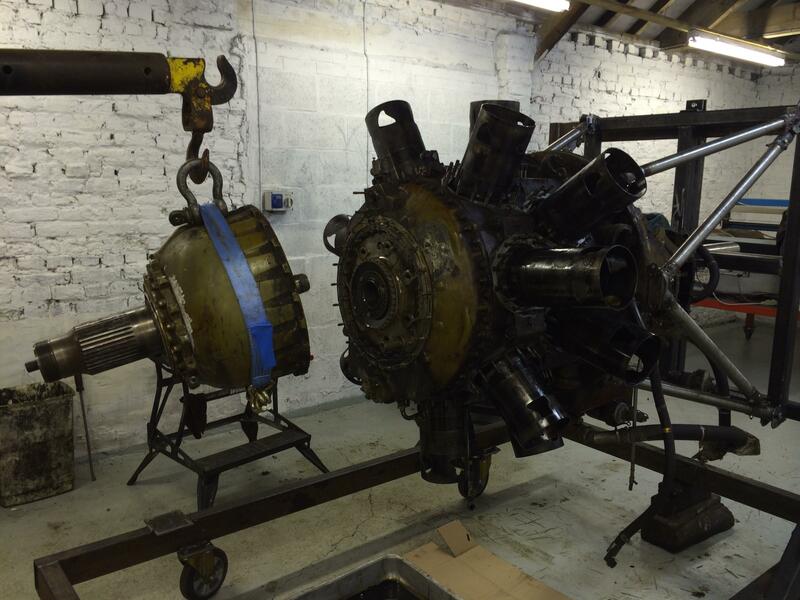 We would like to display an engine with the full size fourteen foot prop on next year at a memorial service held by the RCAF only a mile from us at Skipton on Swale , it should look mighty impressive.